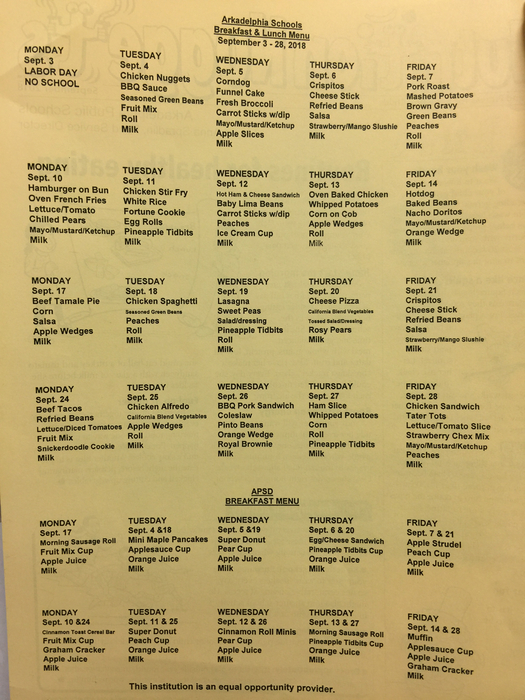 SCHOOL LUNCH MENU INFO: If you’re trying to access school lunch menus on the APSD app, select the “All” option instead of “This Week” or “Next Week” in drop-down menu. Checking to see why it’s not displaying like normal. 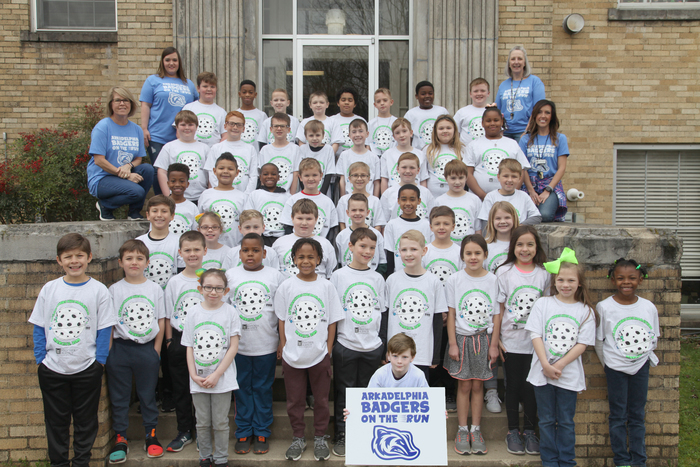 Good luck to our "Badgers on the Run" from Central and Peake who will be completing their 26th miles at the Little Rockers marathon tomorrow in Little Rock. Great work thus far and finish strong tomorrow! 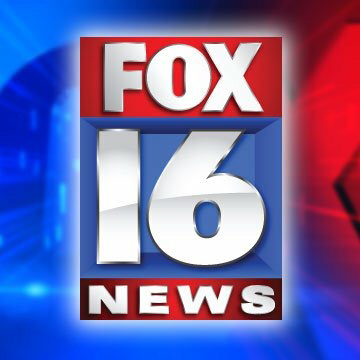 As of 11:04 am, Arkadelphia Police Department has notified APSD that all campuses have been released from the lockout. Thank you for your patience. 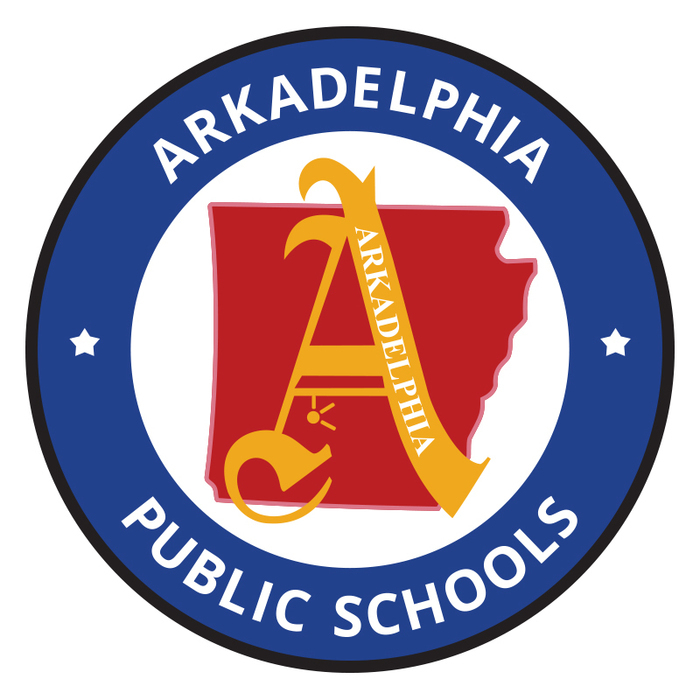 Due to a situation at a local bank, the Arkadelphia Police Department has advised all APSD campuses to go on lockout. That means no one is allowed in or out of campuses until further notice. We have been advised that there is no imminent threat to our campuses. Reminder: No school until Tuesday! 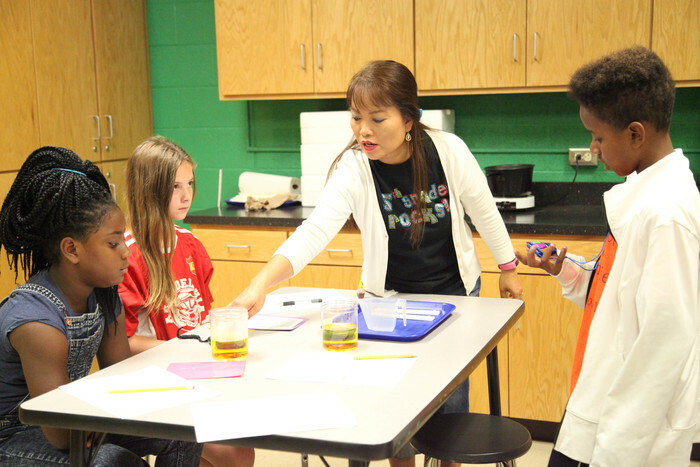 We hope that you have scheduled a time to visit with your child(ren)'s teachers during PTC. 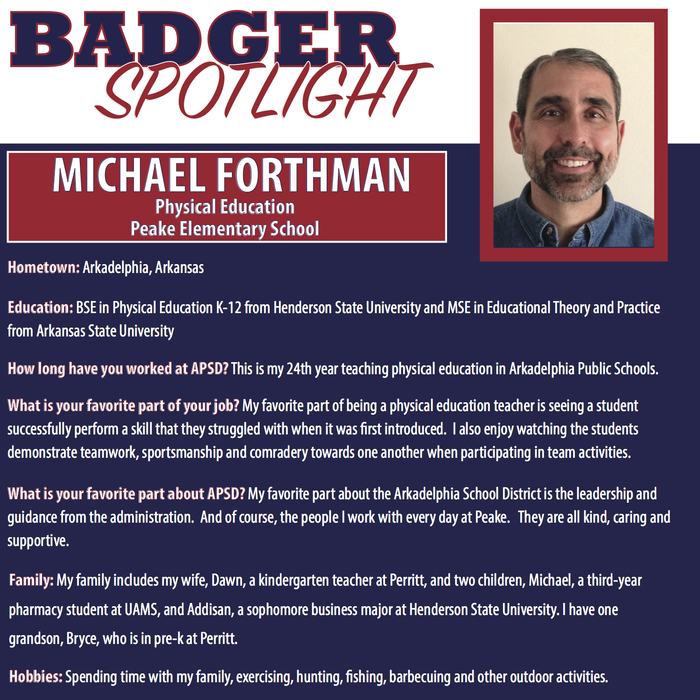 When you're there, we invite you to help out with a short APSD Communications Survey that you might be asked to fill out at one of your schools. Thanks! Don't forget that Parent/Teacher Conferences are this Thursday, Feb. 14, from 2-7 pm on all of our campuses. Check with your respective schools to make sure you have a time to visit with the teachers this Thursday! Peake kicked off a delicious fundraiser today! This popcorn is oh-so-good and has a feature flavor, Badger Pop, that would be a perfect snack for those football games. 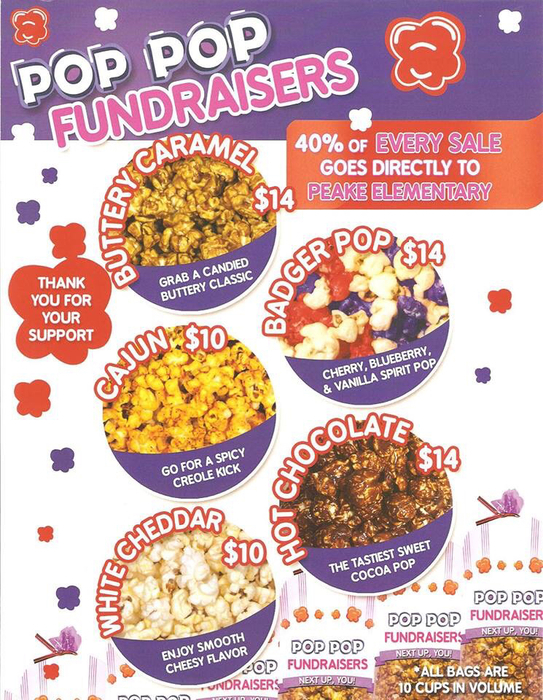 Sales for Pop Pop Popcorn began today and will continue through the 18th. All monies and order forms are due by Friday, Sept. 21st. Please look for a parent letter and order form coming home with your child today. Other events this week are: *Sept. 4- Students received petitions for Student Council elections *Sept. 6- Signed petitions are due to Council Advisors *Sept. 6- Goodies with Grandparents; 7:30 am in Cafeteria *Sept. 6- Fall Pictures (ALL students will have pictures taken for the yearbook.) Only students who purchased pictures will receive packages. *Sept. 7- Preliminary Student Council elections to determine which candidates will run for office. Summer is almost here! 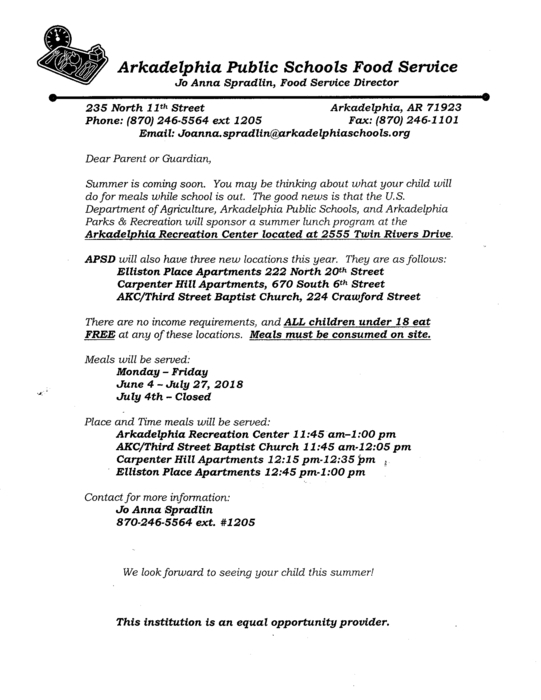 If you're child is needing meals this summer, please see the attached flyer with information on our summer lunch program. It's FREE. Please share with your friends and family. 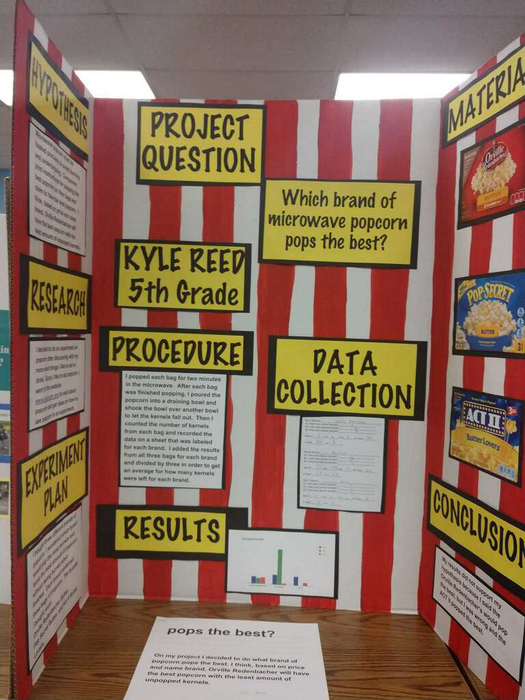 Just a sample of our AWESOME SCIENCE PROJECTS at PEAKE!!! 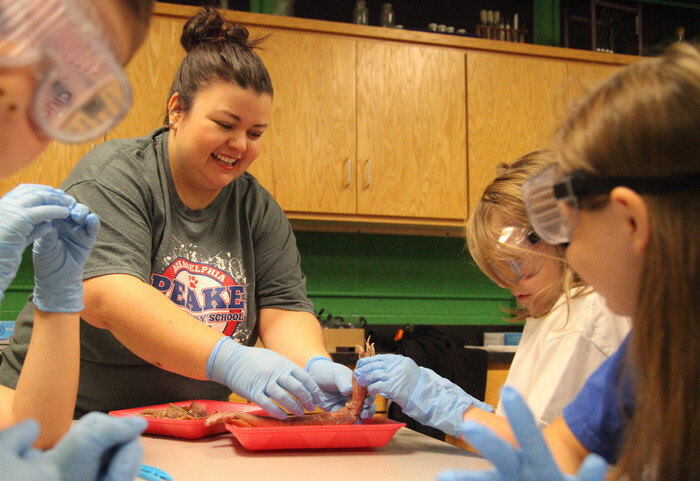 Help us congratulate Mrs. Joy Rippeto on being named Peake's 2017-18 Teacher of the Year! You deserve it, Mrs. Rippeto! Peake students honoring our Local Veterans!!!! 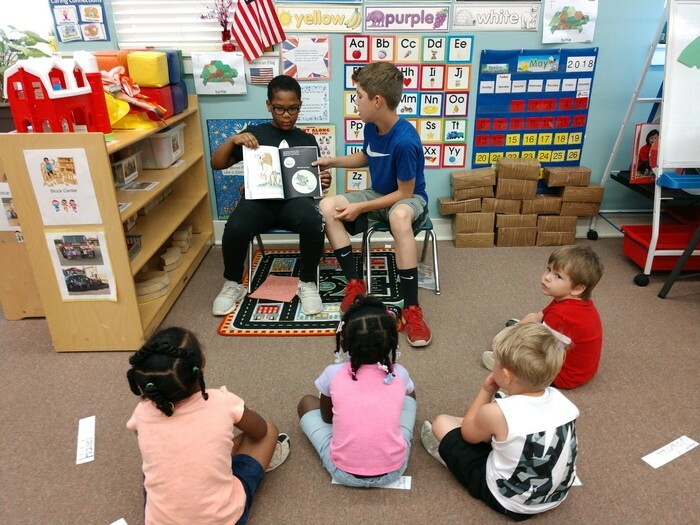 4th Grade GT students from Peake Elementary walked over to do a reading to the Peake Rosenwald students on Monday, May 14th. This 'Read Day; was started through the Imagination Library with Ms. Elaine Kneebone. The majority of books read were from the Imagination Library. 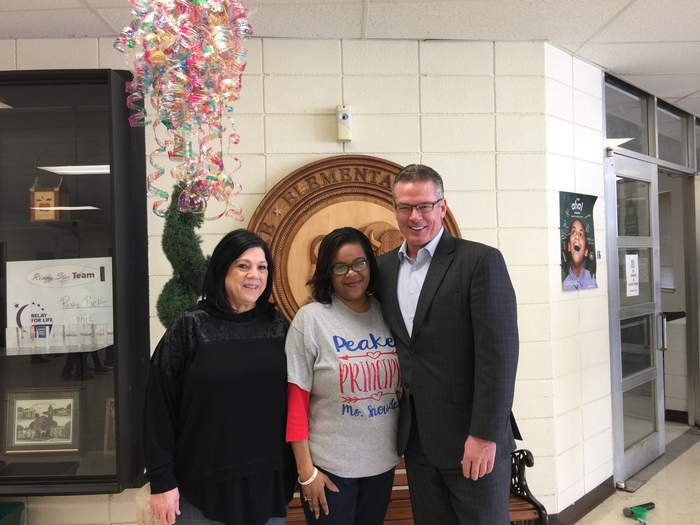 Thank you to Elaine for the introduction to this program, and Tasha Hines for letting us visit Peake Rosenwald. 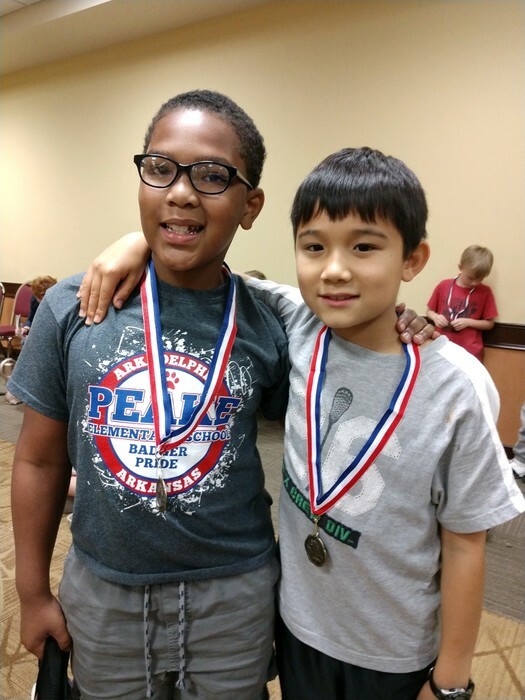 Two 4th grade Peake students participated in the Dawson Chess Tournament today. Lance Gulley tied for 3rd place, and Seth Molinari tied for 2nd place. So proud of these students! Great job to all these Peake students who served at Muffins with Mom to a standing room only crowd. HAPPY MOTHER'S DAY! A HUGE thank you to all the parents who came out last night to our Family Night! We APPRECIATE you! Also, I am truly thankful for the parents who played in our parents vs. teachers basketball game! You all made it such a fun night for us and our kiddos! Can’t wait to do it all again next year!! 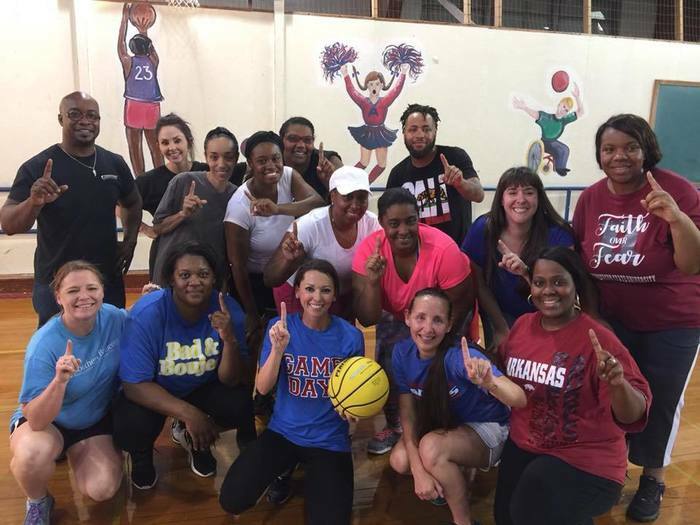 Peake PARENTS won the faculty vs. parents basketball game last night during Family Night! Thank you so much for playing. You all made it so fun! Please join us for Muffins with Moms this Thursday, May 10 beginning at 7:30 AM in the Peake Elementary Library. Peake will host Family Night and 2nd Annual Teachers vs. Parents Basketball Game on Thursday, May 10 from 5:30 to 7:30 p.m. Come out for a fun-filled night of activities! Bring one can of kid-friendly food to be entered into a drawing for educational door prizes! This year we will offer grilled hot dogs, chips and a drink for only $2.50 per person! We will use the money we make to purchase Chromebooks for our classrooms! Any parent who is interested in playing on the team should contact Ms. Sorrells to sign up. We promise if you want to play we will have a spot for you. 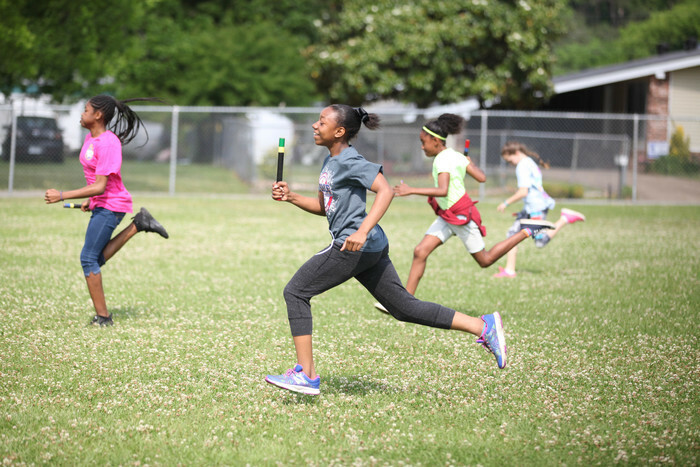 Peake Elementary School's 4th grade students participated in Jay Davis Field Day this morning. 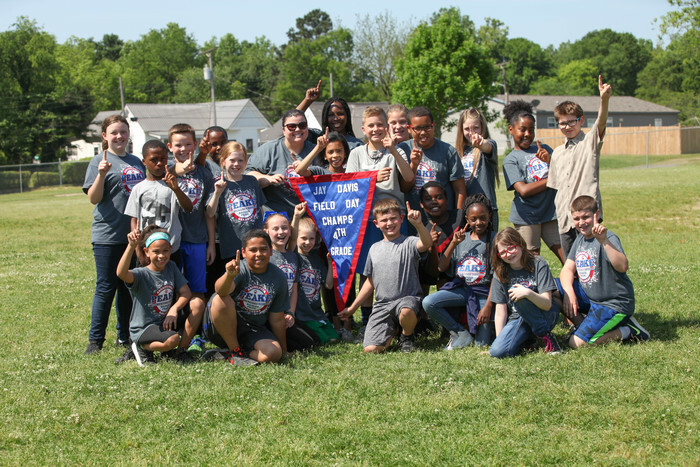 Congratulations to the 2018 Jay Davis Field Day champions, Mrs. Wright's class! 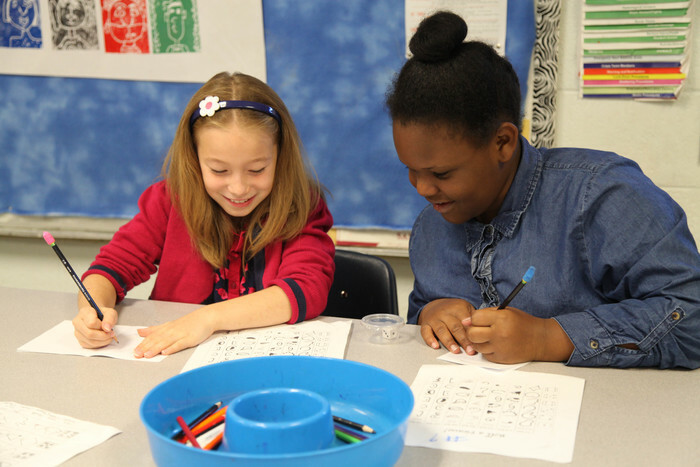 Peake students are celebrating the end of testing weeks with a Fun Day today! 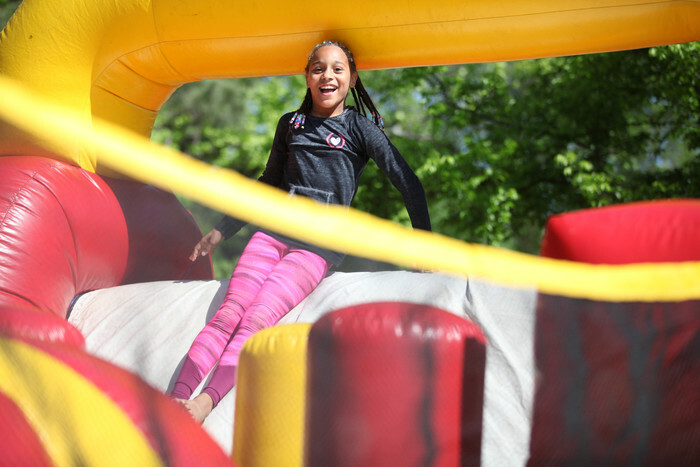 4th and 5th grade students are enjoying bouncy houses, snow cones, and various games, such as sack races and ring toss. 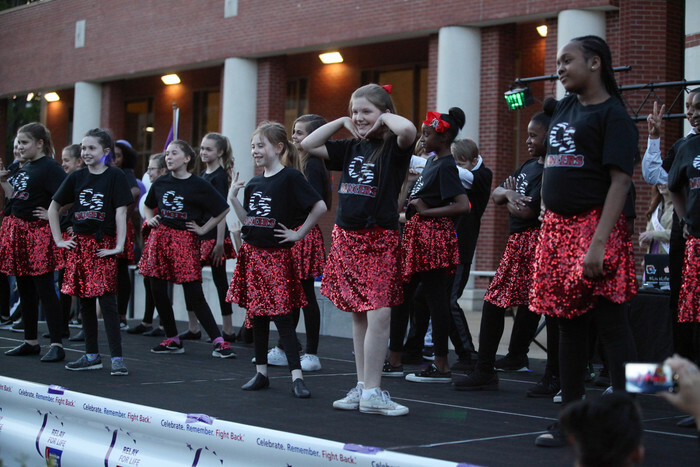 The CS Dancers and New Edition Choir did an excellent job performing at Clark County Relay for Life on Friday. See more photos on Peake's Facebook page. 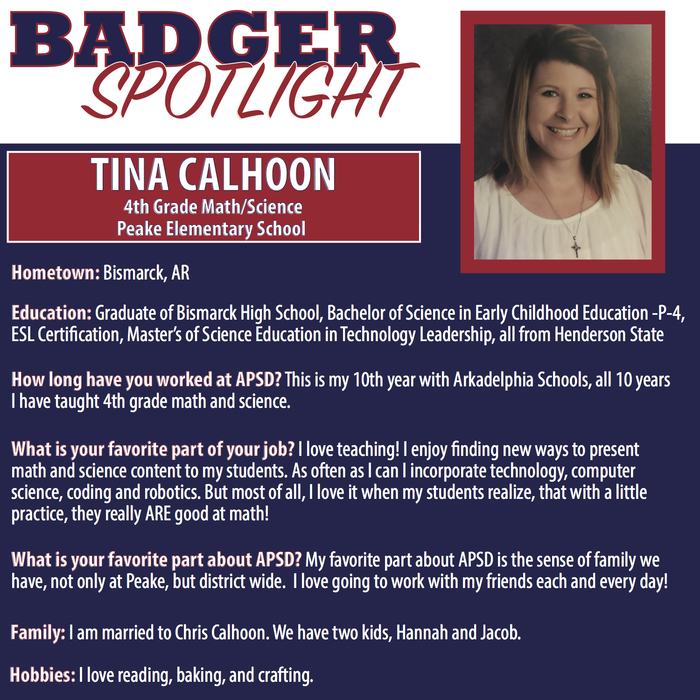 Arkadelphia Public Schools Badger Blast: April 16-21 - https://mailchi.mp/cbce0f2d5705/arkadelphia-public-schools-badger-blast-april-16-21 To receive the Badger Blast by email every Monday, click the link and select "Subscribe" in the top left corner. 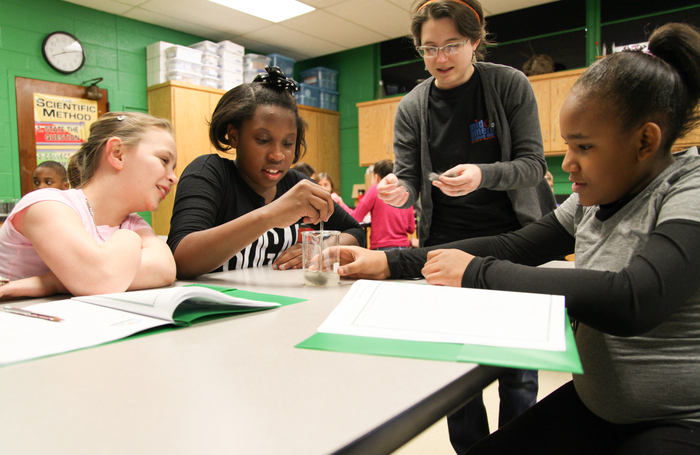 Reminder: The 4th grade classes of Ms. Clark, Ms. Jackson and Ms. Wright will travel to DeSoto Bluff tomorrow. Don't forget: Peake Elementary's group pictures are tomorrow, April 11! 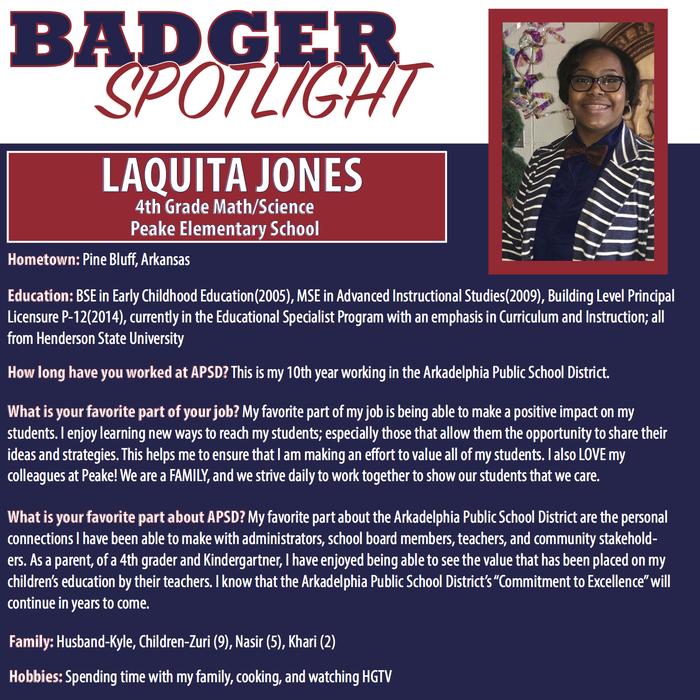 Arkadelphia Public Schools Badger Blast: April 9-14: https://mailchi.mp/6528268bfc8c/arkadelphia-public-schools-badger-blast-april-9-14 To receive the Badger Blast by email every Monday, click the link and select "Subscribe" in the top left corner. Excellent performance by the C.S. 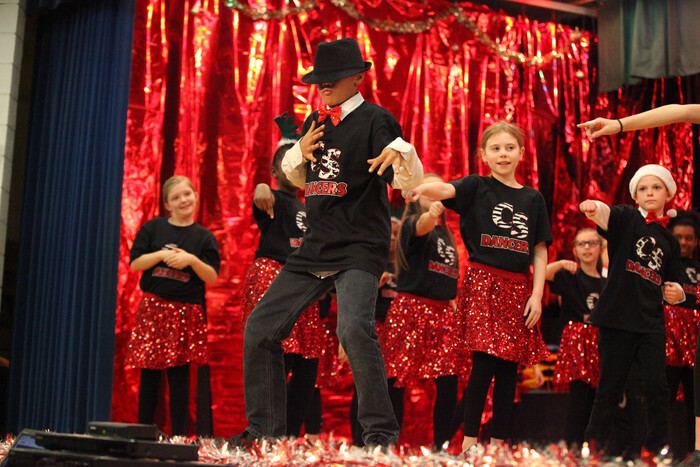 Dancers, New Edition Choir and 4th grade classes of Calhoon, Greis, Brawley, and Kingdon yesterday. We hope you were able to make it! 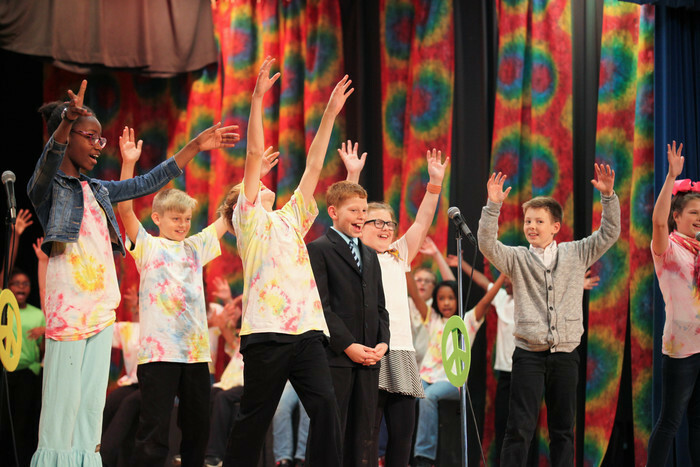 The 4th grade classes of Calhoon, Greis, Brawley, and Kingdon will perform a spring musical this afternoon. 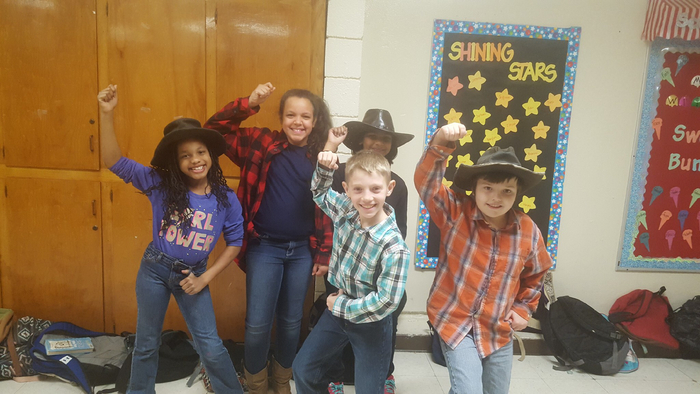 Show times are at 1:30 and 6 p.m.
APRIL 3, 2018 IMPORTANT DATES TO REMEMBER April 5 – Spring Musical – Calhoon, Greis, Kingdon and Brawley April 9 – 4th Grade to DeSoto Bluff – Calhoon, Greis, Kingdon and Brawley April 11 – Group Pictures April 11 – 4th Grade to DeSoto Bluff – Clark, Jackson and Wright April 16 – 20 – 4th Grade Testing April 23 – 27 – 5th Grade Testing April 20 – No Smokemon – 5th Grade – 12:45 April 20 – RELAY FOR LIFE – HSU QUAD – 6:00 April 24 – Progress Reports Go Home May 8 – Jay Davis Field Day – 4th Grade May 9 – Jay Davis Field Day – 5th Grade May 10 – Muffins With Mom – 7:30 AM – Media Center May 14 – Growing Healthy Parent Meeting – 5:00 PM – Media Center May 21, 22 and 23 – Growing Healthy – 5th Grade May 22 – Spring Pictures May 25 – Spring Parties – 2:00 PM May 28 – MEMORIAL DAY – NO SCHOOL May 29 – Celebration of Success Assembly May 30 – LAST DAY OF SCHOOL PHYSICAL EDUCATION NEWS Peake students recently completed physical fitness testing. The testing consisted of sit-n-reach, mile run, shuttle run, pull-ups & sit-ups. 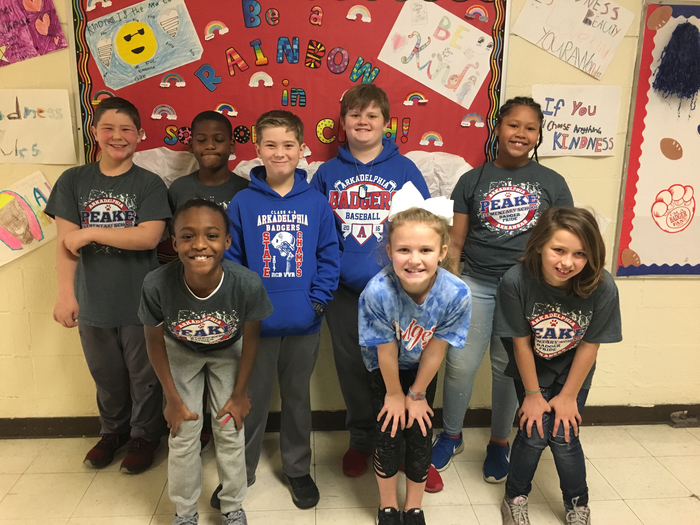 Students who earned the Presidential Youth Fitness Award (scoring at least 50% on each test) were: Jennesis Davis, Treasure Owens, McKenzie Yeagle, Ellie Echols, Blake Moody, Micah-Claire Cowart, Jayden Piggee, Katie Jo Batson, Sydney Covington, Javion Garner, Xe'Nai Harper, Orion Roberts, Ava Thomason, Maggie Phillips, Jon Ross Simpson, Halle McGough, O'Bryant Roberts, Michael Brownlee, LaVonte Gleason, Maddie Vance, Brody Wells, Daisy Cervantes, Dillon Rogers, Quentavion Morris, Paige Byrd and Miles Parker. Congratulations to these students on their achievement! 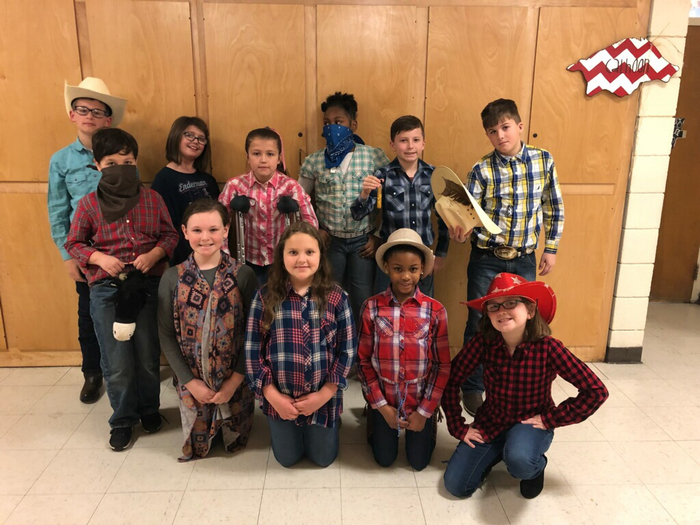 Upcoming Events: Thursday, April 5th: Spring Musical with 4th grade classes of Calhoon, Greis, Brawley, and Kingdon; show times are 1:30 and 6:00 pm Monday, April 9th and Wednesday April 11th: 4th grade field trip to Ouachita Baptist University and DeSoto Bluff; students must wear dark gray Peake t-shirts; students will return to school around 2:00 pm. Please contact teachers for which classes go on what day. 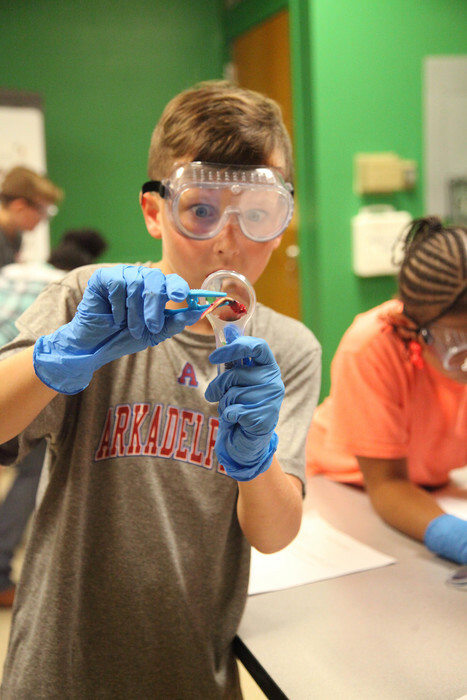 Field trip is ONE day...grade will be split into two groups Monday, April 16th- Friday, April 20th: 4th grade ACT Aspire state testing; please try to schedule appointments around this week Monday, April 23rd- Friday, April 27th: 5th grade ACT Aspire state testing; please try to schedule appointments around this week. 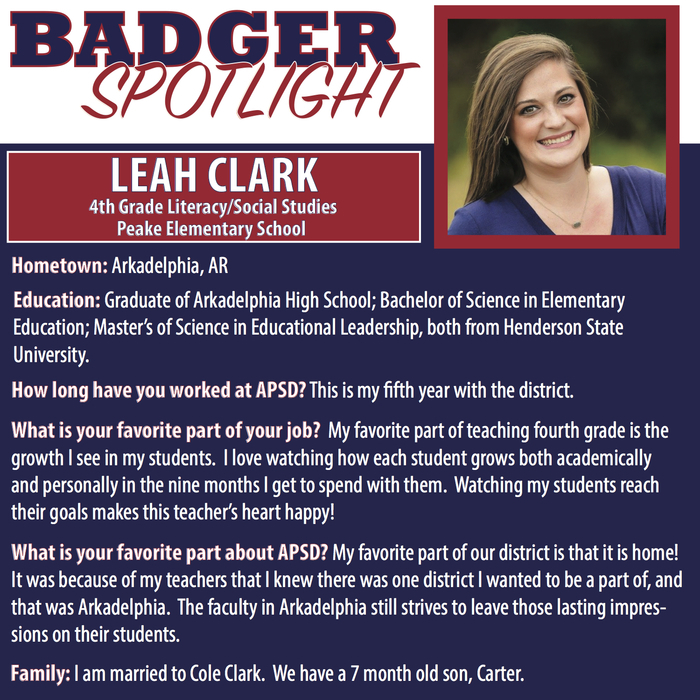 Arkadelphia Public Schools Badger Blast: April 2-6: http://mailchi.mp/3e8f27cc3242/arkadelphia-public-schools-badger-blast-april-2-6 To receive the Badger Blast by email every Monday, click the link and select "Subscribe" in the top left corner. Thank you so much to the Clark County employees! 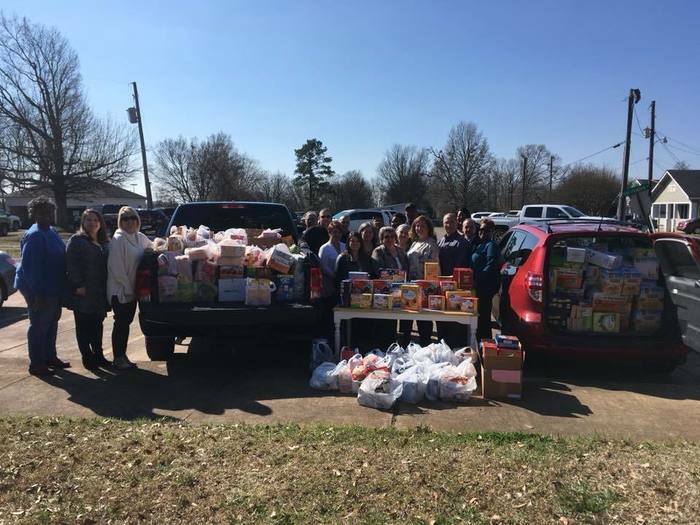 They set a new record with their food drive with 13,082 food items and an additional $150 donation. Thanks to these wonderful folks many of our local children will have food in their backpacks over the weekends! Fox16 came to Peake!!! 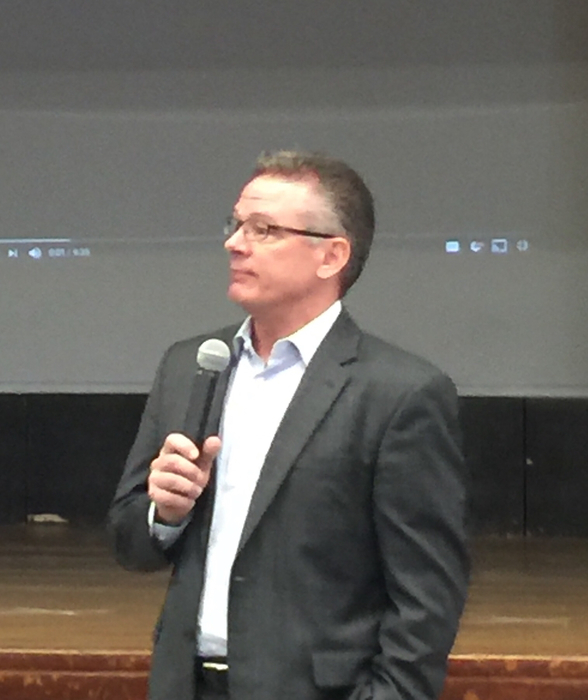 Thank you Kevin Kelly!!! Kevin Kelly is speaking to our Peake students! IMPORTANT DATES TO REMEMBER: March 19-23- SPRING BREAK, March 27 – Report Cards Go Home, April 5 – Spring Musical, and April 11 – Group Pictures. 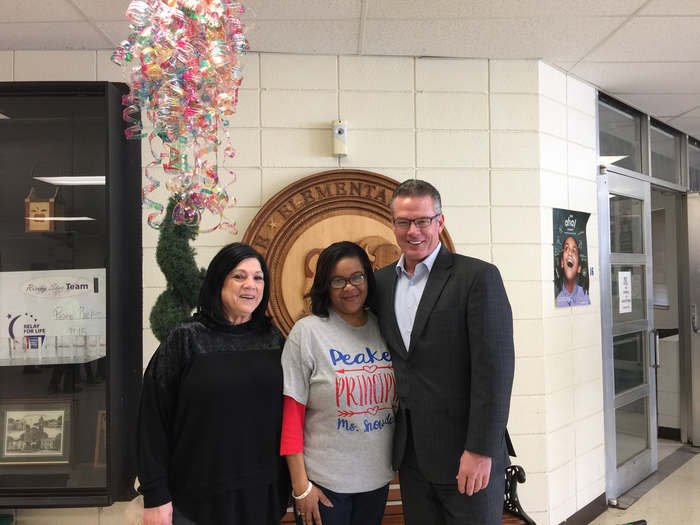 Peake Elementary would like to give a BIG thanks to Dominique Walker and Brandi Hughes for coming out in this weather to open car doors for our students. 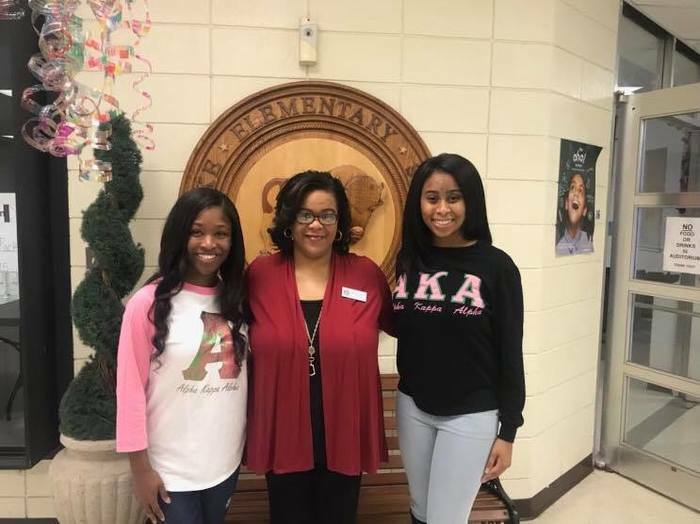 These ladies are members of Alpha Kappa Alpha Sorority, Theta Eta Chapter. 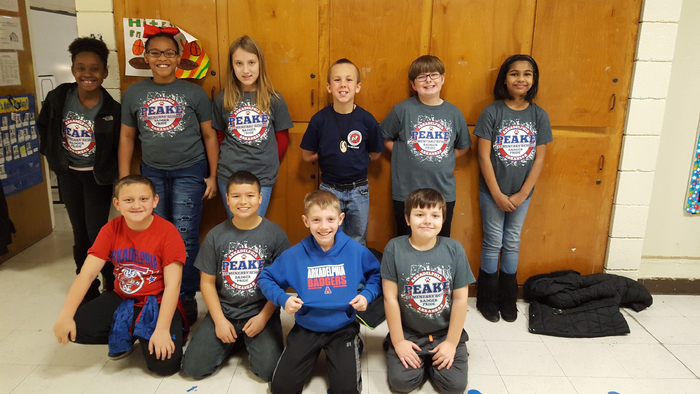 Peake's 5th grade Quiz Bowl team won 4th place in the Murfreesboro Quiz Bowl Tournament on Feb. 8. 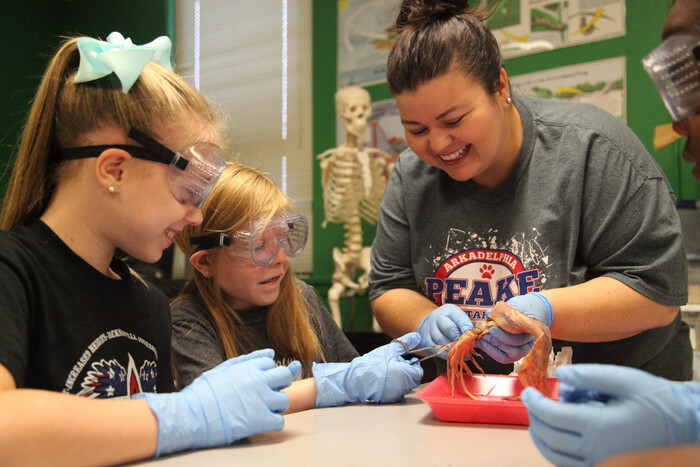 Peake was among 14 5th and 6th grade teams that participated in this event. 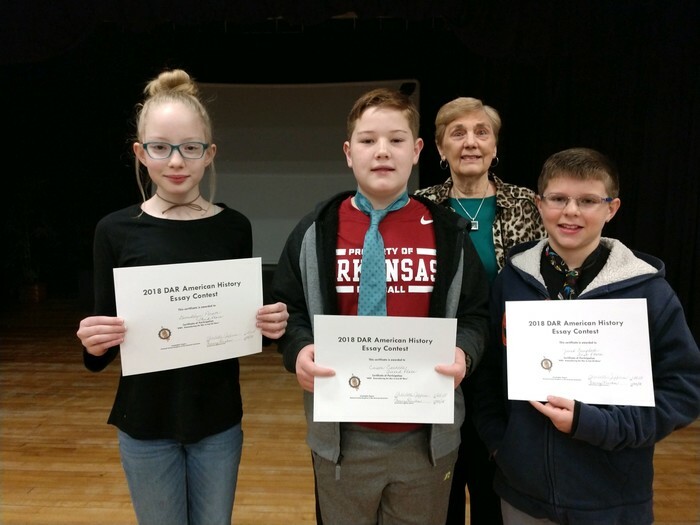 On Monday, January 29, Nancy Rucker from Daughters of the American Revolution (DAR) presented a certificate to Jared, Carson, and Gwendolyn for placing Top 3 in the essay contest. 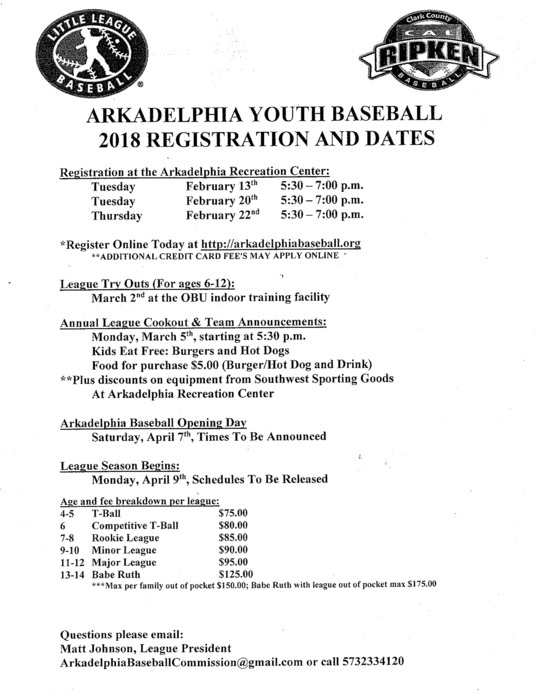 Registration for Arkadelphia Youth Baseball will be on Feb. 13, Feb. 20, and Feb. 22 at Arkadelphia Parks and Recreation. You may register online. Boys 4 to 14 years old may sign up. 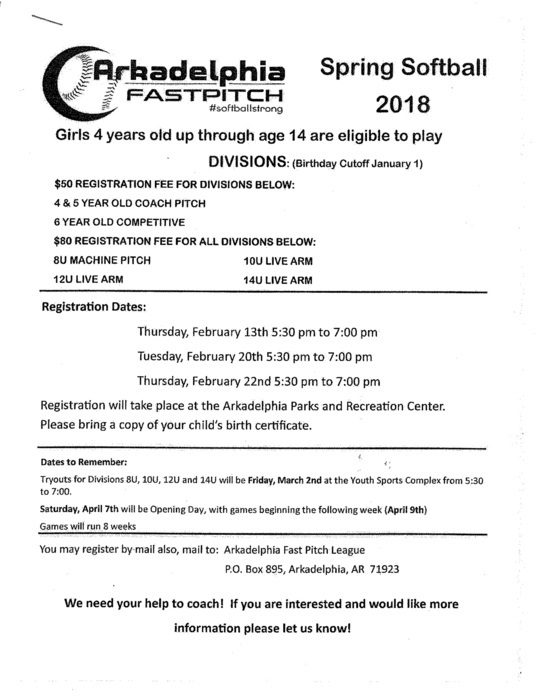 It's time to register for spring softball at Arkadelphia Parks and Recreation! Girls 4 to 14 years old are eligible to play. See flyer for info. on how to register. Arkadelphia Parks and Recreation is hosting the annual Daddy-Daughter Dance on Feb. 11 from 5:30-8:30 p.m. See flyer for more information. 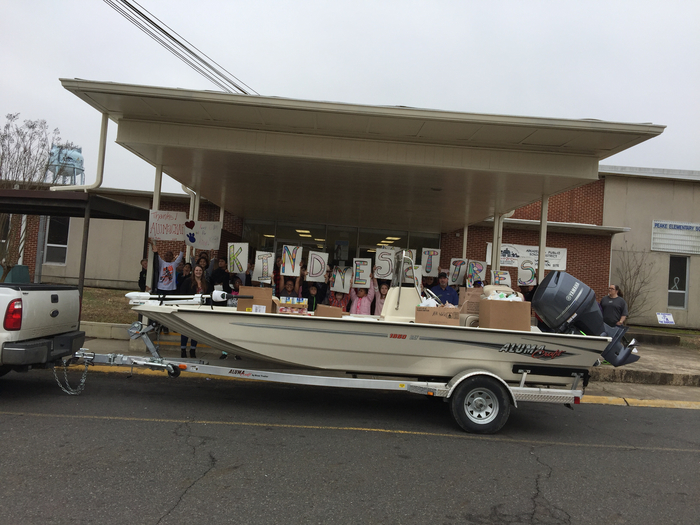 ALUMACRAFT delivered food to the schools that was collected by their AWESOME staff!! We THANK YOU from PEAKE!! Kindness Matters!! 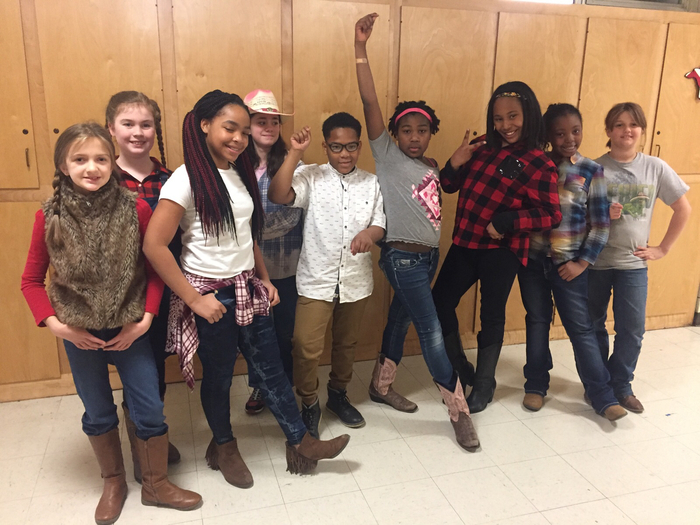 Western wear day!! Kindness week is so fun!! 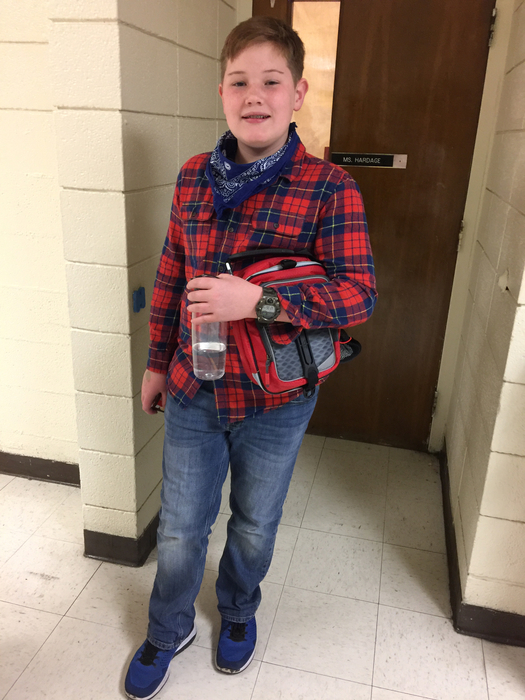 Western wear!! 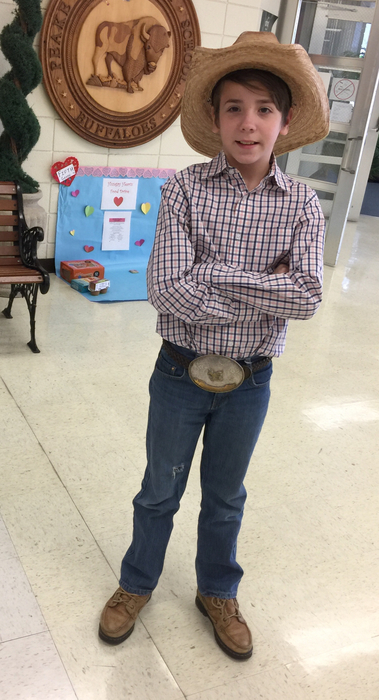 Yee-Haw for Kindness!! 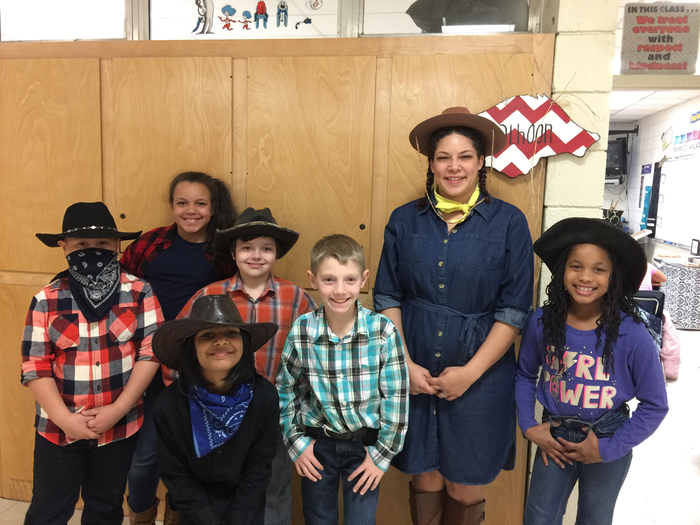 Students dressed in western wear!!! Ms. Rocole caused quite a disturbance today!! Happy kindness week!!! 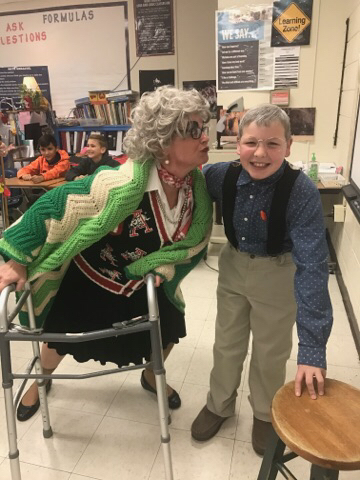 Tomorrow-Jan. 31, 2018 is KINDNESS NEVER GETS OLD-dress like and old person!! Tomorrow is "Don't Hide from Kindness" day. 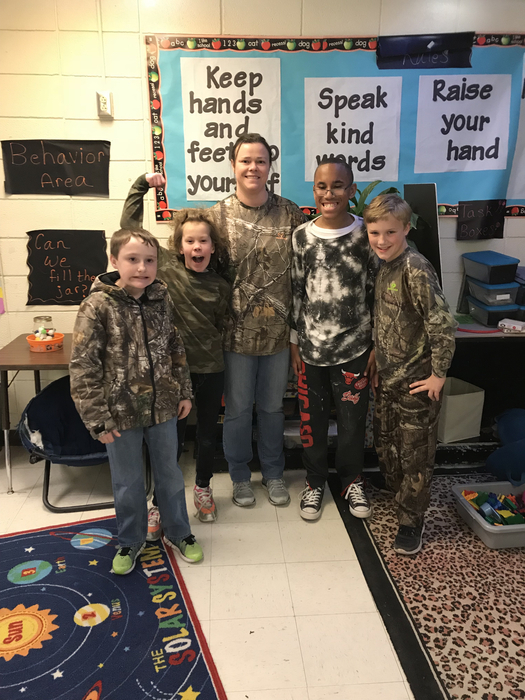 Don't forget to wear your camouflage! 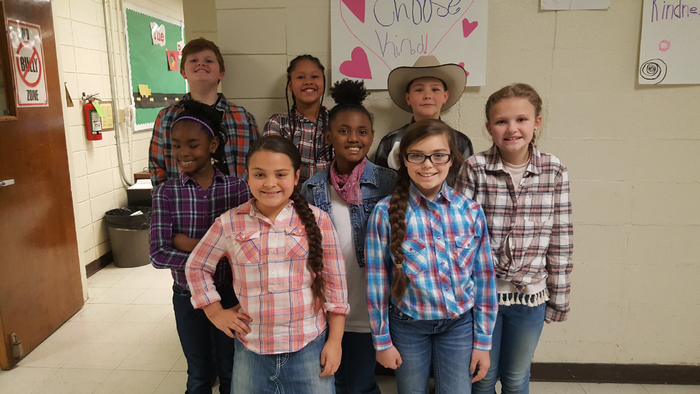 Great Kindness Week is THIS WEEK at Peake! 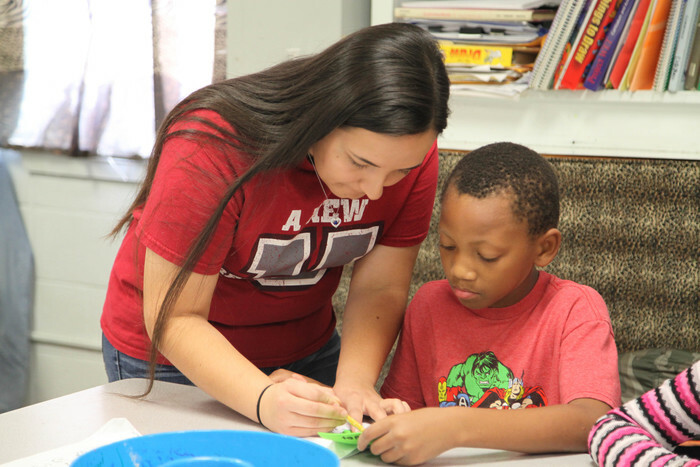 This morning, we had lots of help from several students as we kicked off the start of this special week. Thank you all for sharing your kind thoughts! 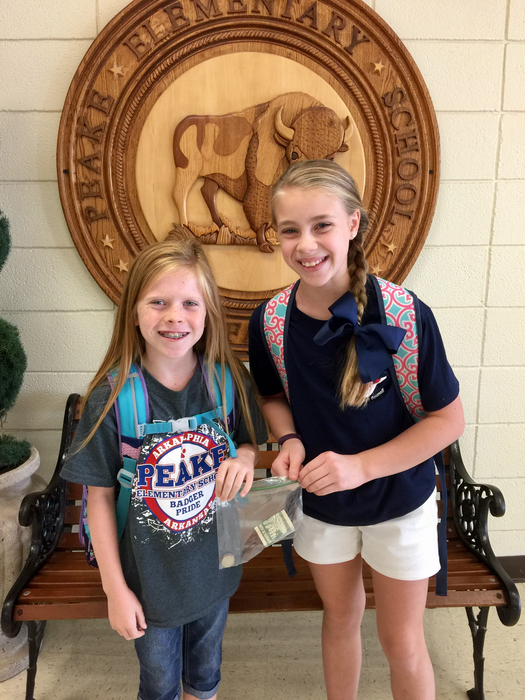 Peake will hold its Great Kindness Challenge kickoff event this morning at 10 a.m. Everyone is invited! Don't forget to wear your tie! Peake Parents in Partnership will meet next Tuesday, January 30th in our library. Please join us from 6:00-7:00 pm. We will be discussing upcoming events and fundraisers! Hope to see you there! 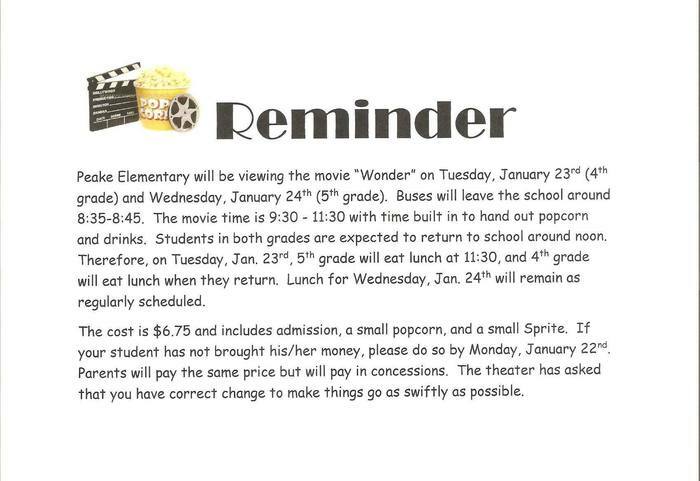 Reminder: Peake will take their field trip to see "Wonder" on Jan. 23 (4th grade) and Jan. 24 (5th grade). Due to the conditions of some rural bus routes and freezing temperatures, Arkadelphia Public Schools will be closed on Thursday, January 18. This will be counted as AMI Day #3. Due to the conditions of rural bus routes and freezing temperature, Arkadelphia Schools will be closed on Wednesday, January 17, 2018. This will be counted as Alternative Method Instructions Day 2. Reminder: Due to inclement weather, Arkadelphia Public Schools will not be in session on Tuesday, January 16, 2018. Students, please refer to your Alternative Method Instructions from your teacher. 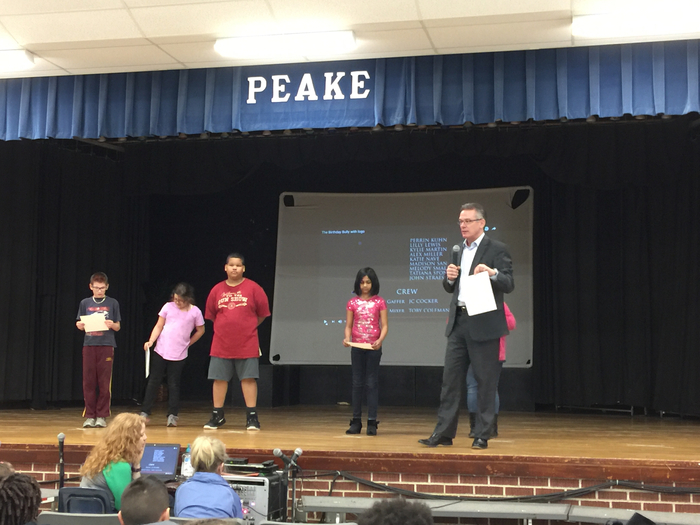 These 4th graders received an award this morning for their PERFECT attendance! Great job! 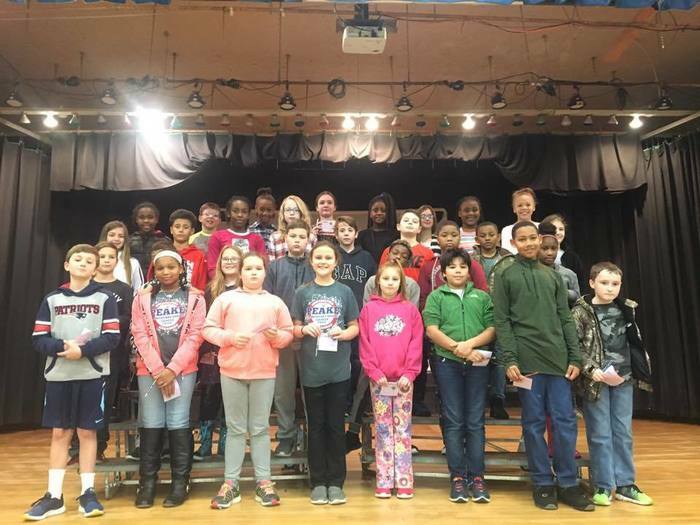 Congratulations to our 4th grade students that made the "All A's" Honor Roll. 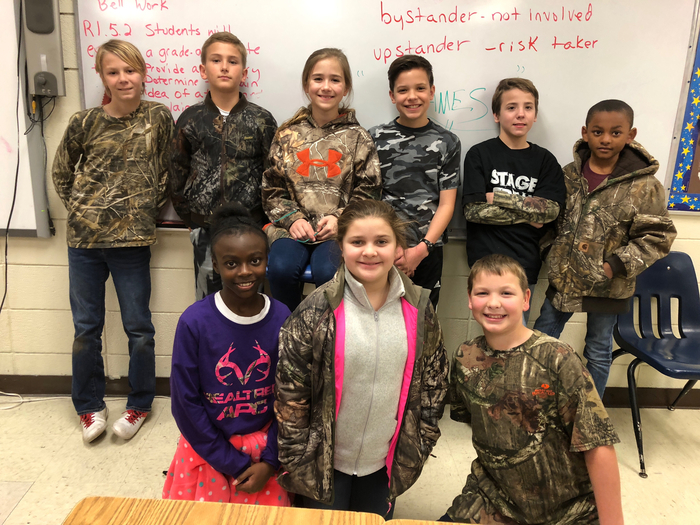 These 5th grade students have PERFECT attendance! Well done! 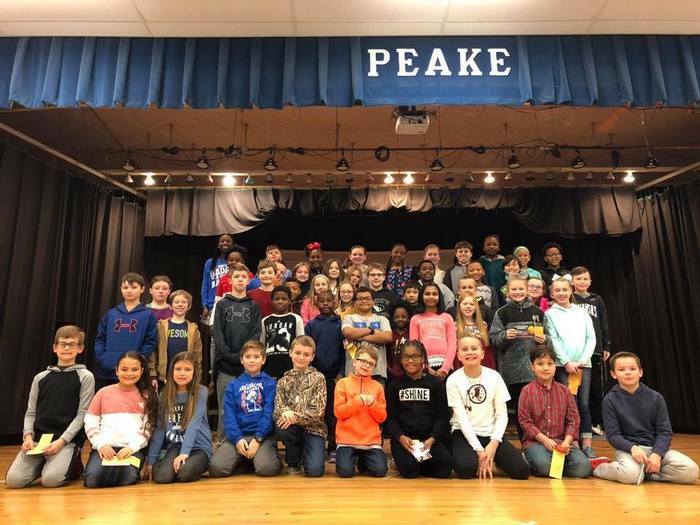 Congratulations to our 5th Grade "All A's and B's" Honor Roll students at Peake Elementary! 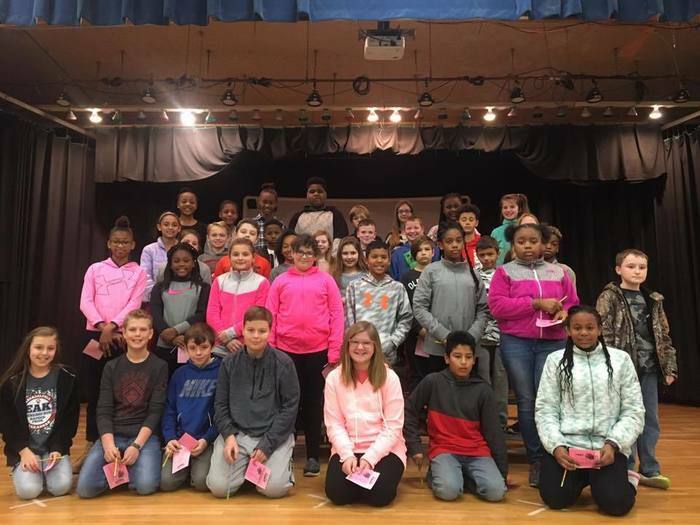 Congratulations to our 5th grade students that made all A's! We are so proud of you! 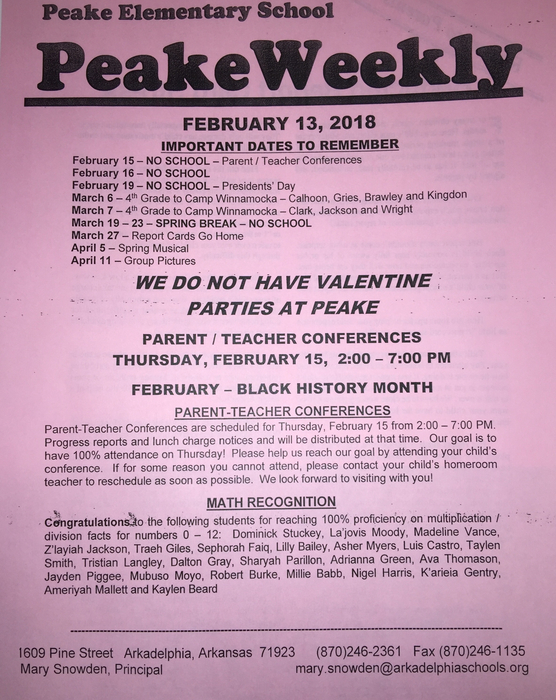 Parents: Students received flyers at school today about an MLK Dance for tomorrow night. I just received an email stating that the dance has been cancelled. I'm sorry for any inconvenience. The New Edition Choir, C.S. 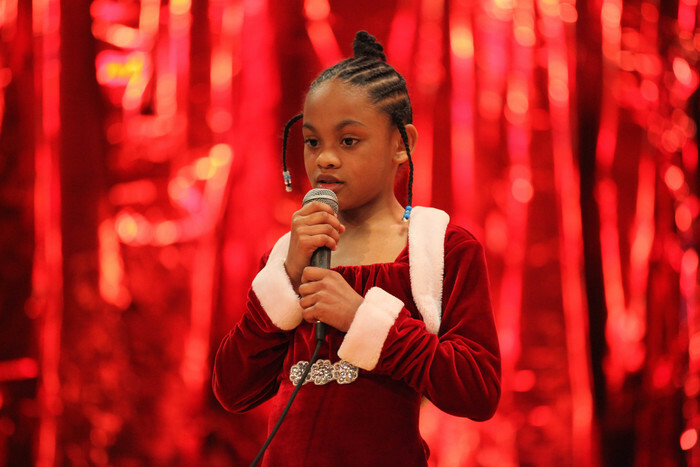 Dancers, and the home room classes of Clark, Jackson, and Wright presented "Broadway Santa" on December 14th at Peake Elementary School. 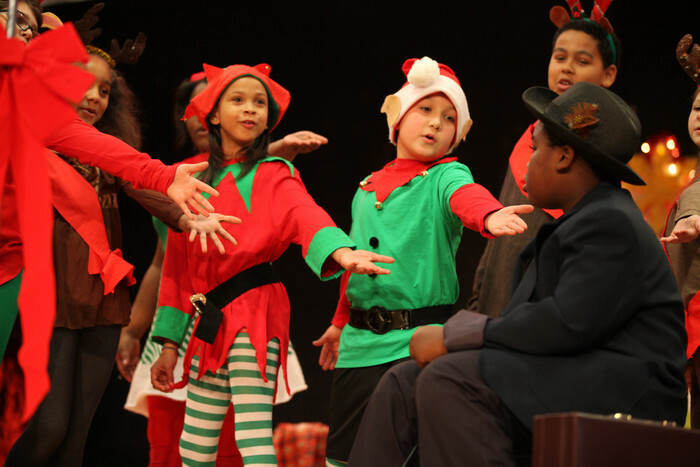 Peake Elementary School will present its Winter Musical at 1:30 and 7:00 p.m. 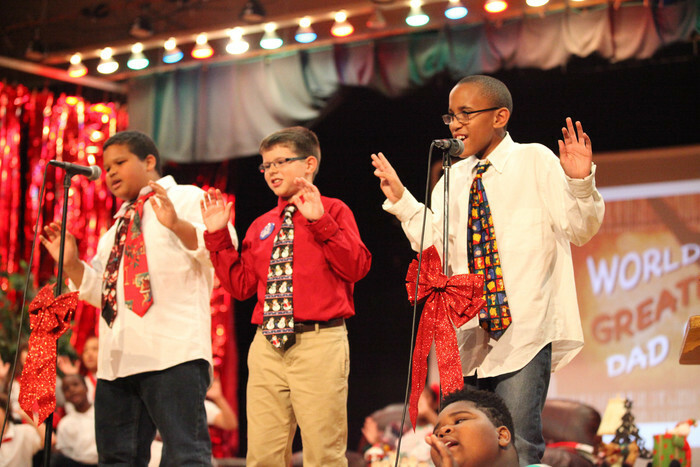 The homeroom classes of Clark, Jackson, & Wright will be performing, along with the New Edition Choir and C.S. Dancers! Peake Elementary School will be hosting Donuts with Dad on Friday, Dec. 1 at 7:30 a.m. We hope you will join us! 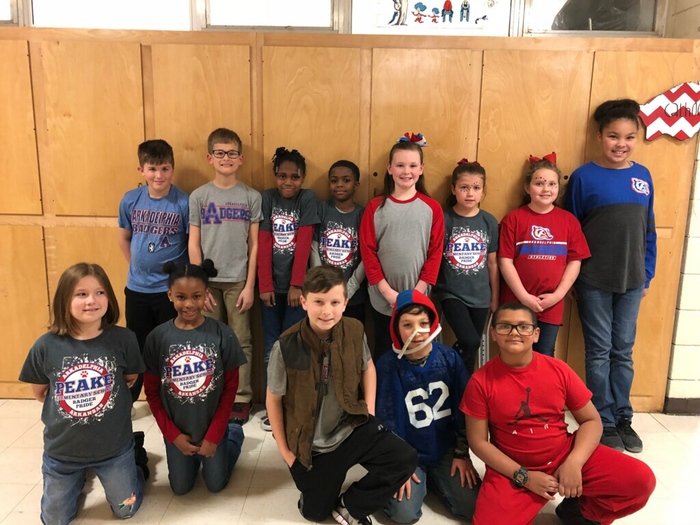 Peake Elementary School will be performing "Patriotic Phantasy" today at 1:30 and 6 p.m. We hope you will be able to attend. 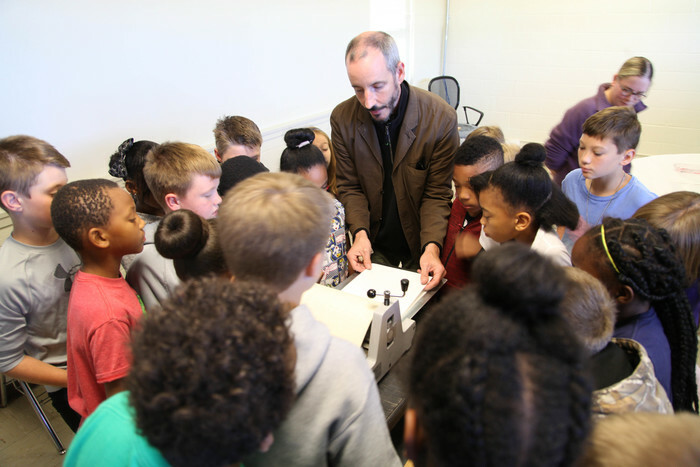 Henderson State University Art Professor David Warren and five art teachers joined Ms. Capps students this week at Peake Elementary School as they work on Picasso faces. 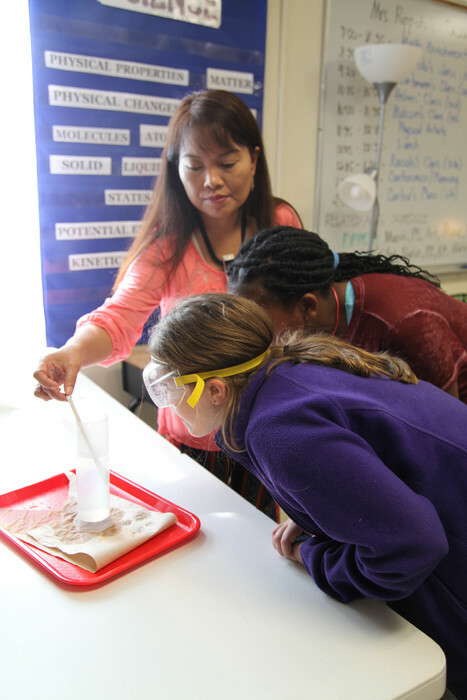 Ms. Rippeto’s science students performed a lab, “Changing States of Matter,” this week, determining what water looks like in its’ three different states: solid, liquid and gas. MORE SQUID! 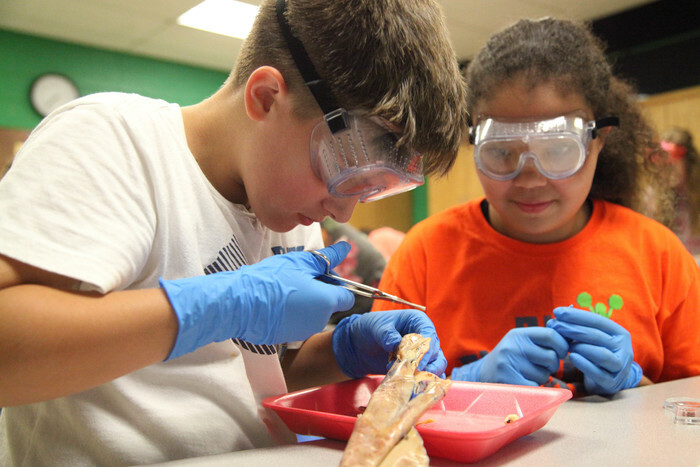 Peake Elementary School students are wrapping up their squid dissections! 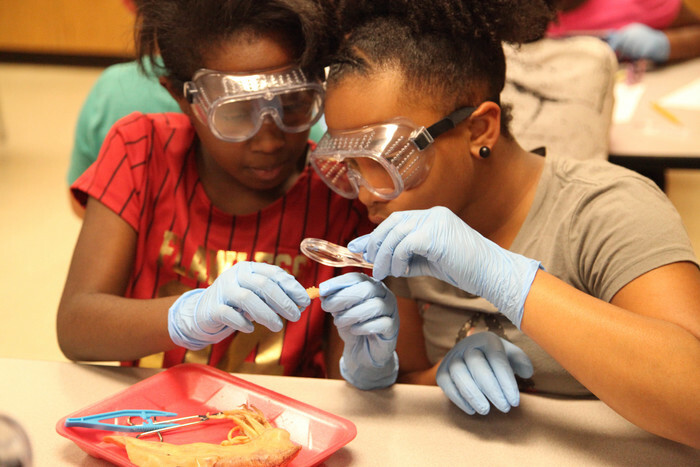 Ms. Leah Clark's class really enjoyed identifying all of the parts of the squid. 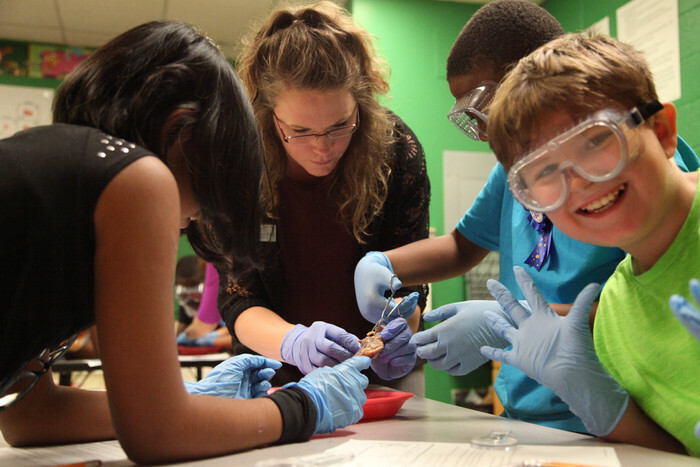 Mrs. Jessica Wright's 4th grade science students had a blast dissecting squids today! You can see more photos on our Facebook. Gildner Dodge Chrysler Jeep Inc. will be hosting a test drive on Sept. 23. For every test drive, Gildner will donate $10 to providing coats for kids! Come out and take a free test drive! 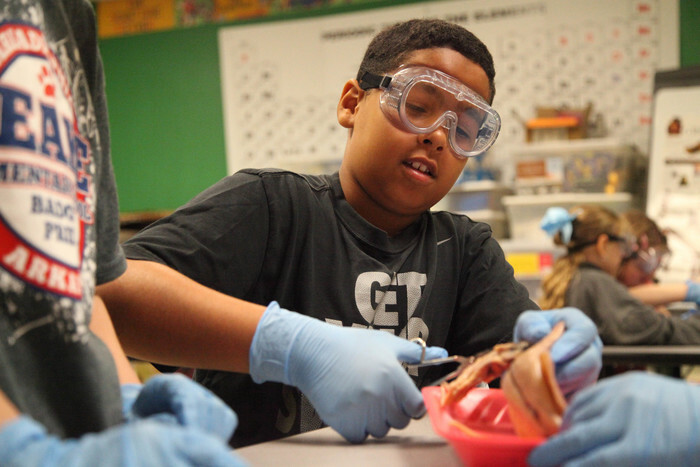 Ms. Calhoon's 4th grade science students dissected squids today during their science lab. 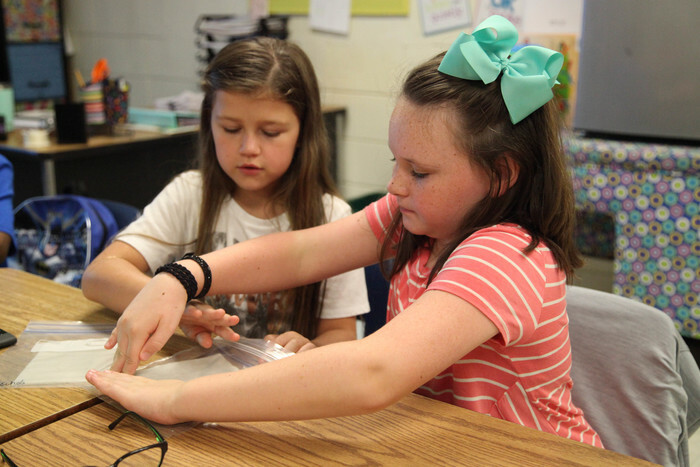 As part of their Plant and Animals Structures unit, students in Mrs. Clark's room created an environment for radish plants to grow. They will track the plant growth over the next few weeks. 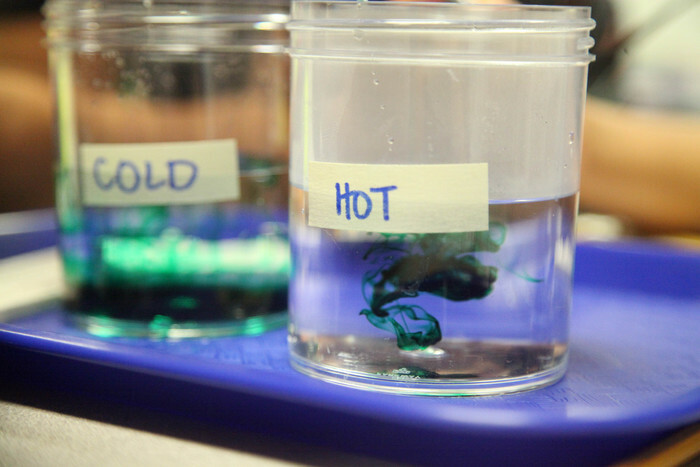 Ms. Rippeto's science class performed a science experiment on Thursday and Friday to answer the research question: Does water temperature affect the speed of coloration? 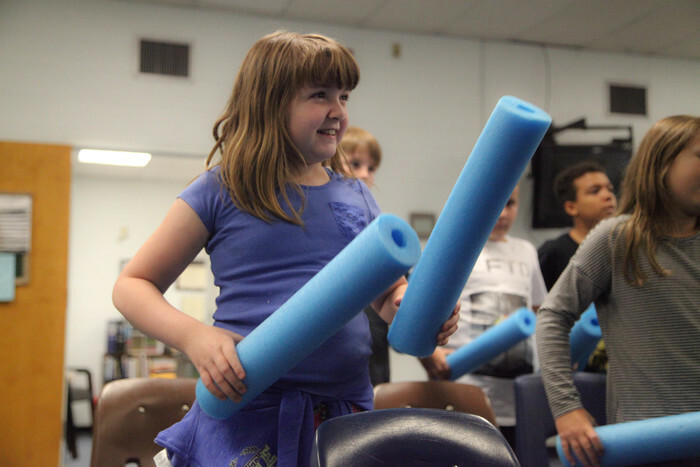 Ms. Cornelius' music classes have been learning a rhythmic pattern & playing it with pool noodles to the song "Happy Together" by the Turtles in order to prepare to use mallets on barred instruments. 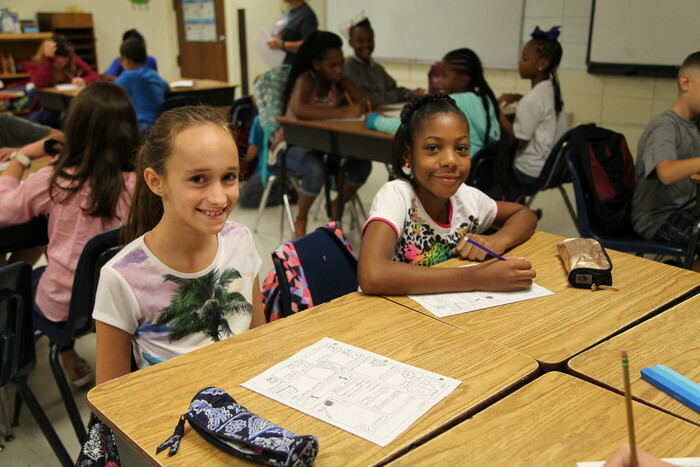 Today was a great start to the 2017-18 school year at Peake Elementary School! SCHOOL STARTS IN 4 DAYS! 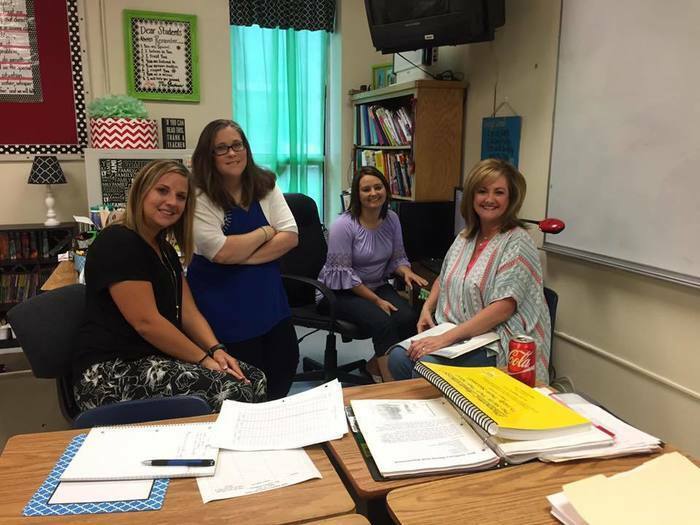 Our teachers are excited to meet all of their new students! 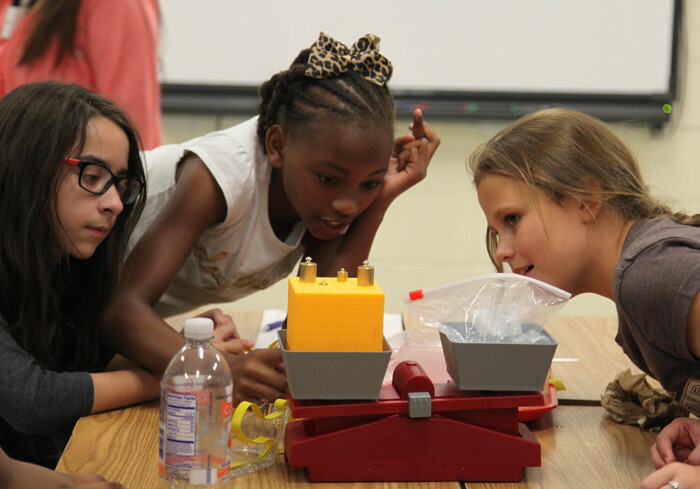 See you tonight at Open House from 7 to 8 p.m.
Open House for Peake Elementary School will be on Thursday, August 10 from 7:00 to 8:00 p.m.
Our 4th and 5th grade students participated in Jay Davis Field Day this week! Congratulations to the classes of Ms. Clark and Ms. Snowden for being our champions this year! Muffins for Moms tomorrow morning! 7:30 a.m. in the Library! 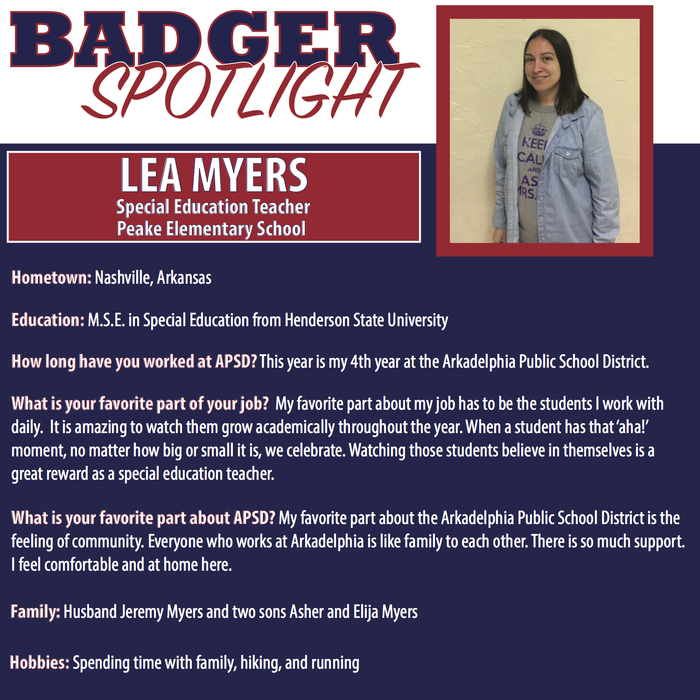 Hope to see all of our wonderful Peake moms! 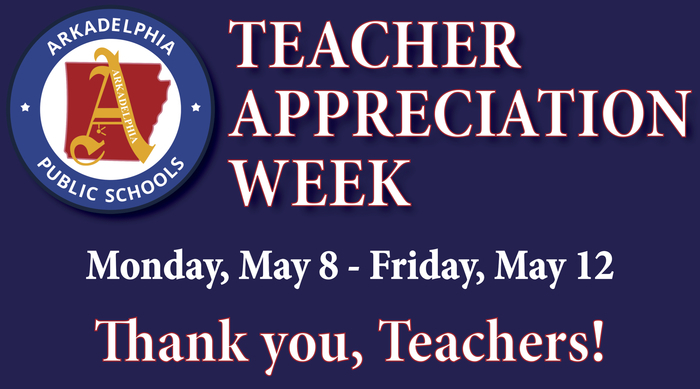 This week is Teacher Appreciation Week. Don't forget to thank your teachers! Coming Up Next Week: Teacher Appreciation Week, Field Days and Muffins for Mom! 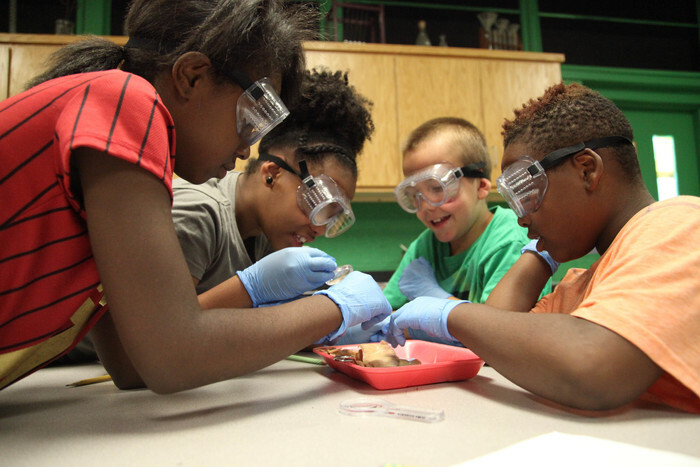 Check out our events calendar and Peake Weekly! 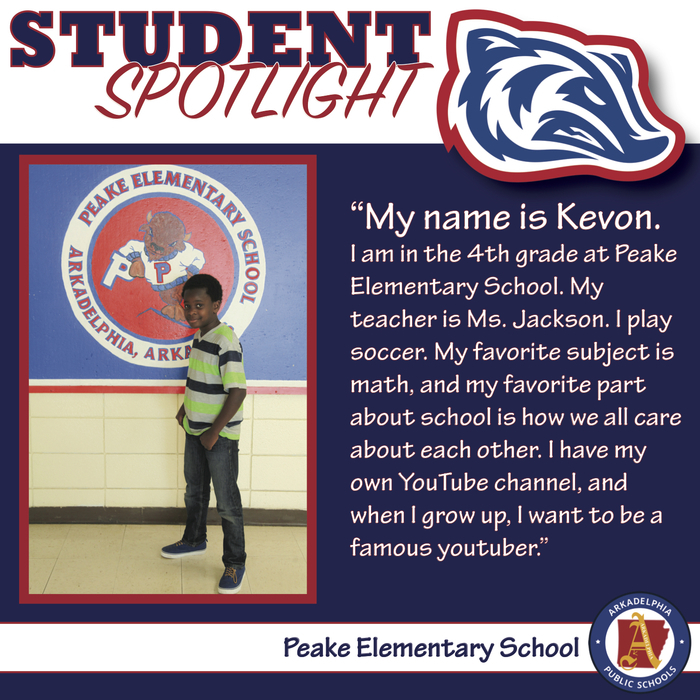 Peake Elementary School's Student Spotlight of the Week! 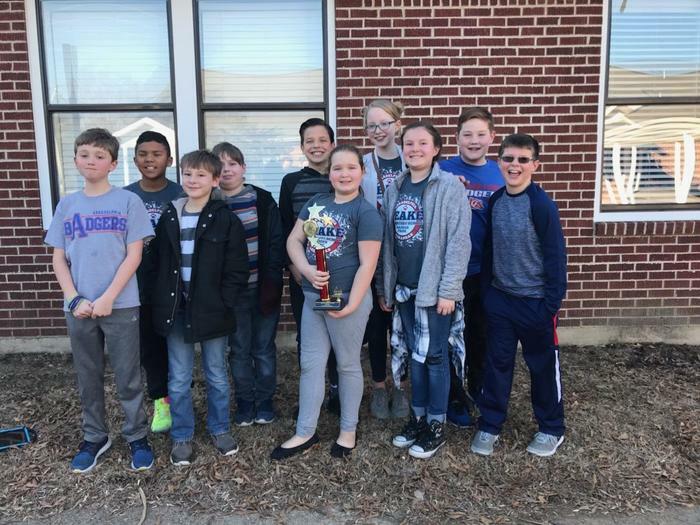 Congratulations to the 4th Grade Quiz Bowl Team for placing 3rd out of 9 teams in today's competition! 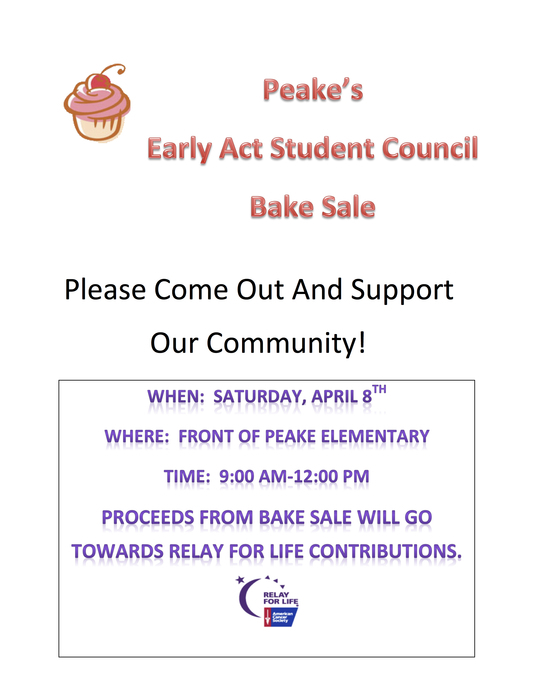 Come out to Peake's Student Council Bake Sale this Saturday and support Relay for Life! Check out today's Communication folder for information about upcoming Relay for Life fundraisers and events! Fundraising booklets are coming home today for students to fill out and return tomorrow. They receive a prize for returning the booklet complete tomorrow! Our school receives money just for filling out the booklets! This money is spent on the students for special events. Thanks for your help! 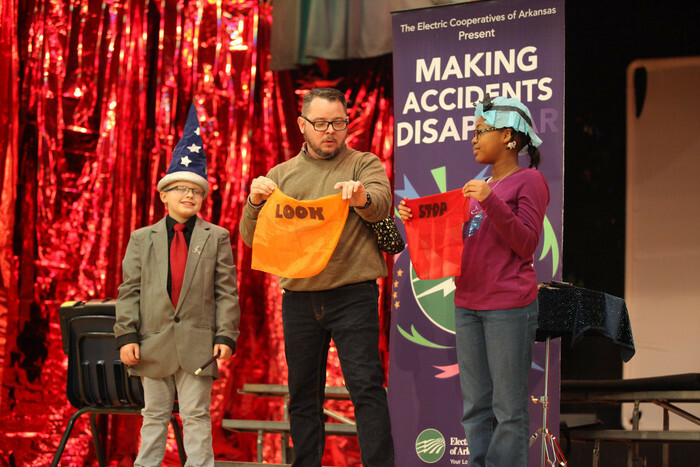 Thank you South Central Arkansas Electric Coop and Magician Scott Davis for presenting an electrical safety magic show, "Making Accidents Disappear", to our students today! 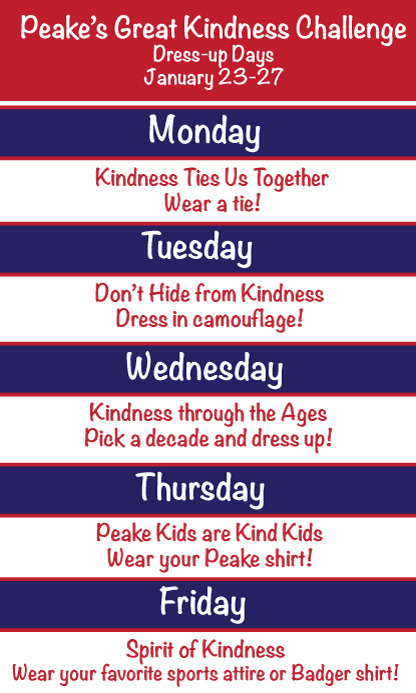 Peake will be celebrating Great Kindness Challenge Week next week by dressing up each day and showing kindness to everyone! We would love for you to participate! 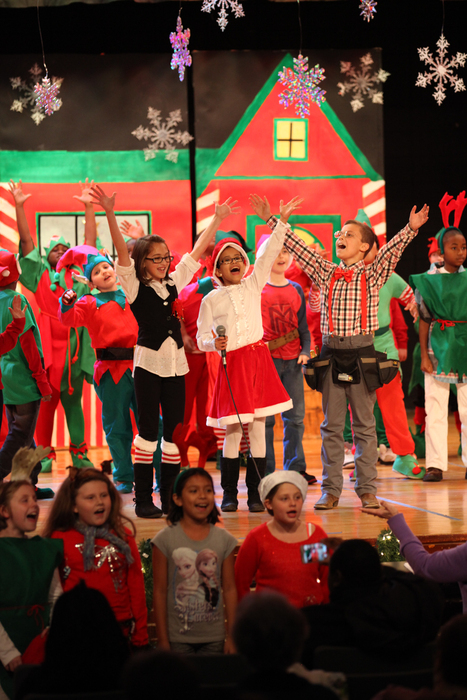 The fourth grade classes of Mrs. Jackson, Mrs. Kingdon, Mrs. Wright and the 5th grade New Edition Choir performed "Dear Santa: A Musical Tweet for Christmas!" on Dec. 8. See more photos on Facebook! 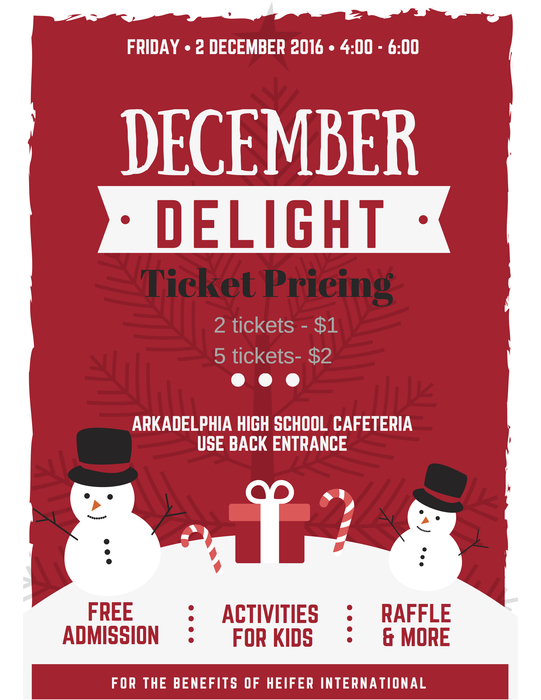 Reminder that December Delight is this afternoon at AHS! We would love to see you and your family there! 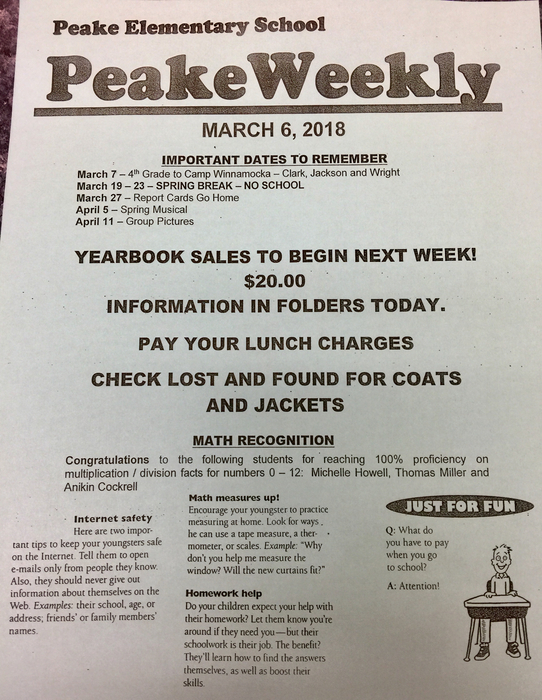 Peake's Annual Report to the Public and Title I Meeting will be presented by Mrs.Thomas in the library at noon tomorrow. Bring a lunch or get one here if it's your lunch break.Hope you can join us! 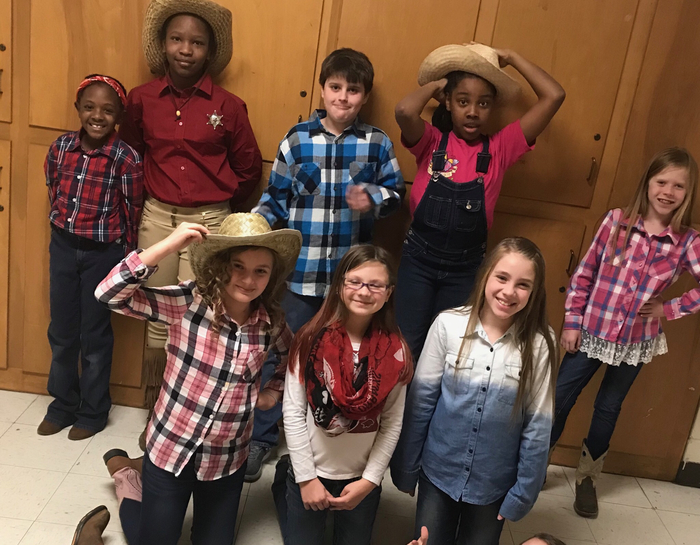 Peake will host the J. Ed Peake Day Assembly today at 2:00 p.m.
Reminder- Our Fall musical, "American Voices," will be presented TODAY at 1:30 and 6:00 p.m. featuring homeroom classes of Helms, Rocole and Snowden. 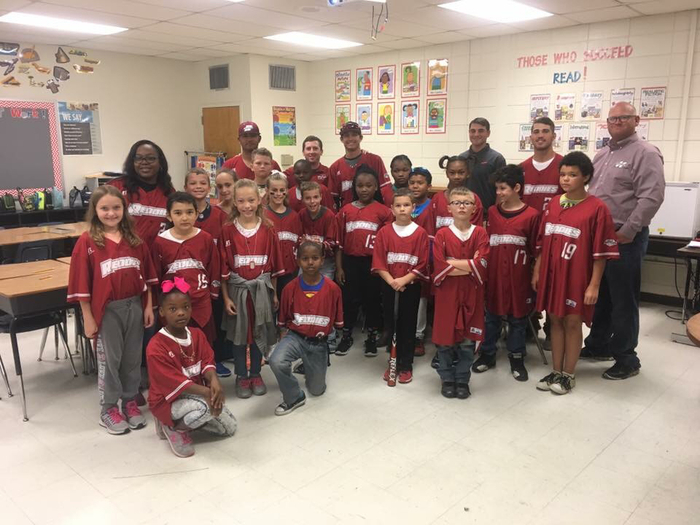 Mrs. Jones' class teamed up with the HSU Reddie Baseball team for "Team Up Against Drugs" Day! Thank you Coach Hooten and players for making these kids' day! More class pics coming soon! Mark your calendar! Picture Day is: Wednesday, Oct 19 Picture Day ID: RP026382Q0 Order at mylifetouch.com by Wed, Oct 19 for free shipping to school. Wednesday is National Walk to School Day! Please join us on our walk to Peake that morning! See attached image for more details. Mark your calendars! Fall Musical date has been changed from October 13th to October 25th. Hope to see you there! Goodies for Grandparents this Friday, Sept. 9th at 7:00 a.m. in the cafeteria! 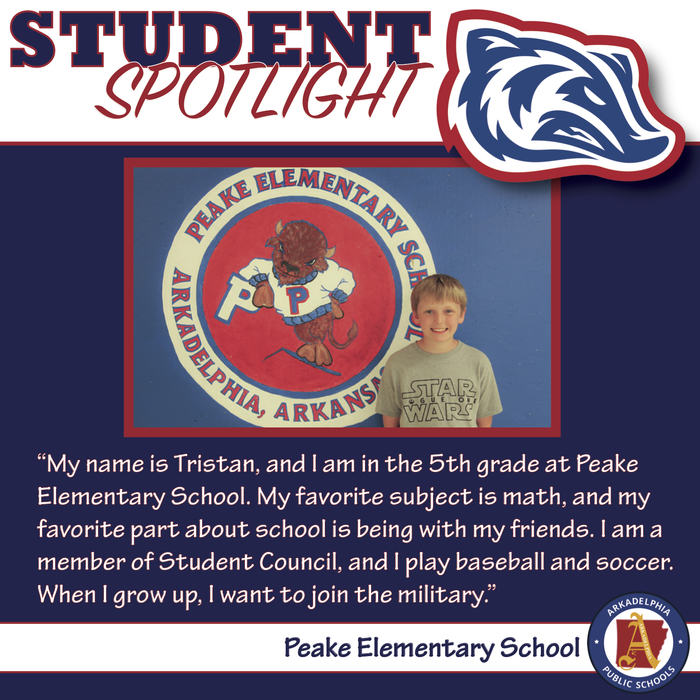 Can't wait to see all of our Peake GRANDS! 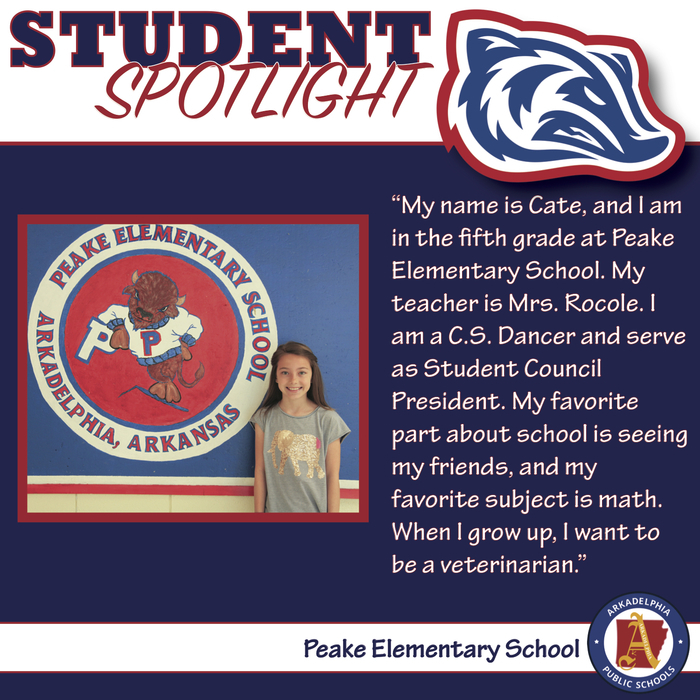 Peake Student Council Election process starts this week! Check out info in the communication folder today or click on this link to view the webpage document: http://5il.co/h1g. 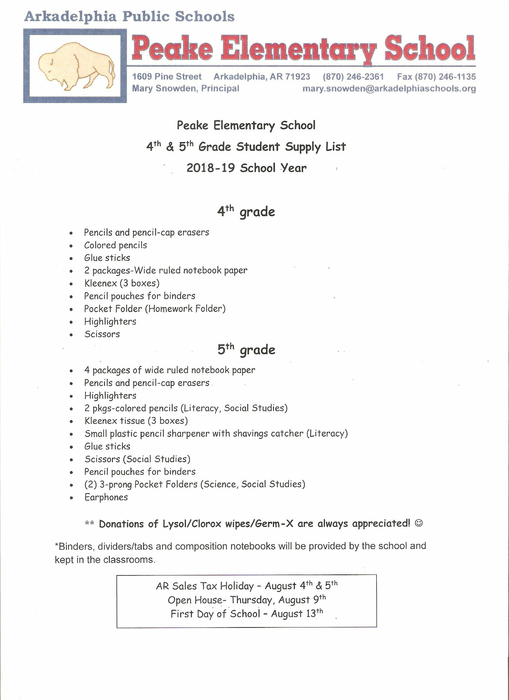 Peake's School Supply list is now posted in the Documents folder on the website and on Facebook. Awards Assemblies are Friday, May 27th. 5th Grade Awards at 12:30; 4th Grade at 1:30. 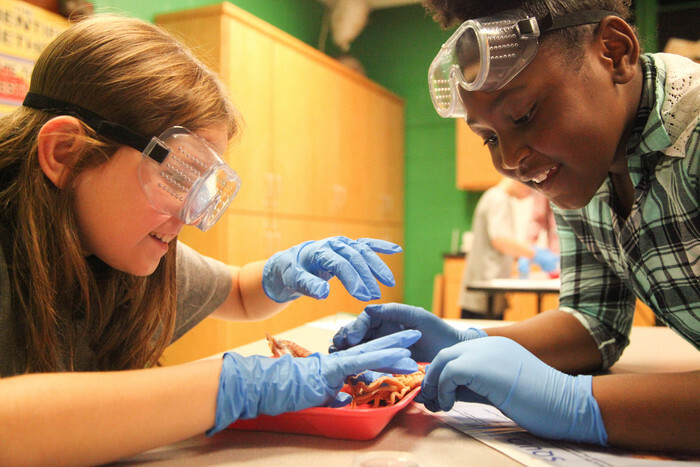 Report Cards distributed in homeroom classes after assemblies. Hope to see you there! You can see photos from the spring musical, "Backstage Bandstand", on our Facebook! Make plans now to attend Muffins with Mom this Friday, May 13th, at 7:30 a.m. in the Library. See you there! 4th Grade Field Trip tomorrow! Wear Peake T-shirt and be on time. Buses leaving at 8:15. 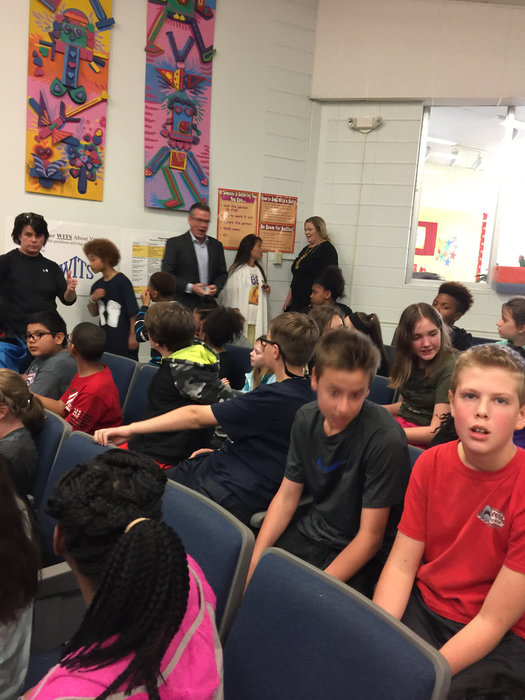 5th Graders went to Goza for a Registration Assembly today. They need to return their registration forms that were sent home today to their homeroom teachers ASAP. Check Communication Folders today for important information regarding 4th grade field trip Friday and 5th Grade Registration at Goza tomorrow! Yearbooks are here! Students that pre-ordered are getting theirs today! We do have some extras. $20, first-come, first-serve! Get yours before they're gone! Check out our Relay for Life fundraising efforts in the Documents folder on our webpage! Bake Sale Sat. morning; thirty-one order form; and chances to win RTIC cups! 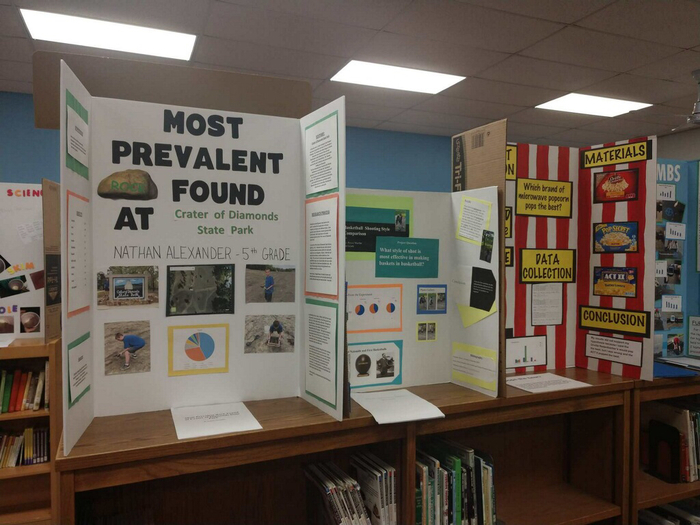 If you need ideas or resources for the upcoming Science Fair, join us tonight at 6:00 in the cafeteria for small group sessions with Peake and HSU faculty and students! 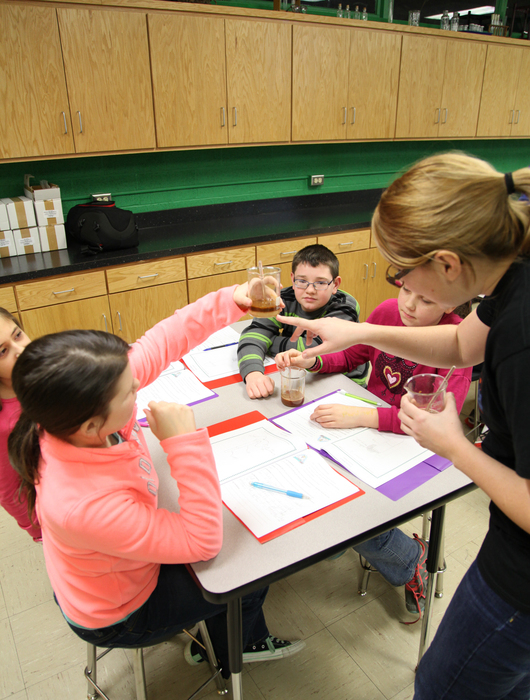 Students earn rewards by being on time, working hard and exhibiting great behavior each day of testing. Letters went home Friday with the details. Details also posted in website Documents folder. 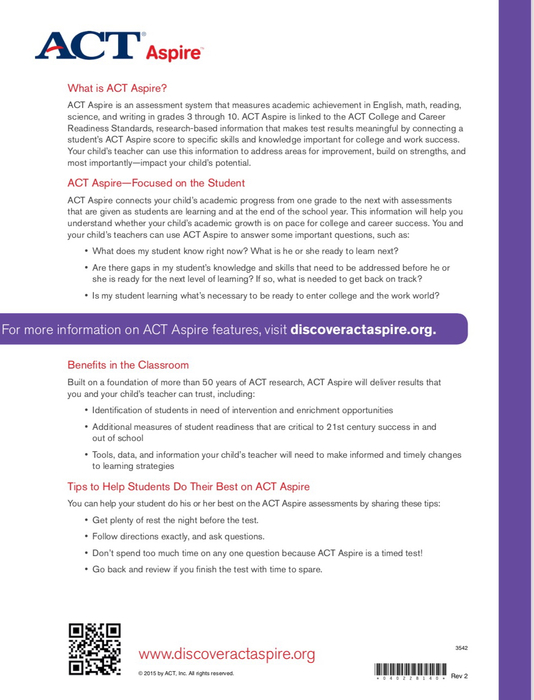 ACT Aspire Testing starts tomorrow and ends Friday! Students eating breakfast at school need to be here by 7:30; all others by 7:45. Class pictures are this Thursday, March 31st. Cost is $12 per picture payable to Lifetouch. 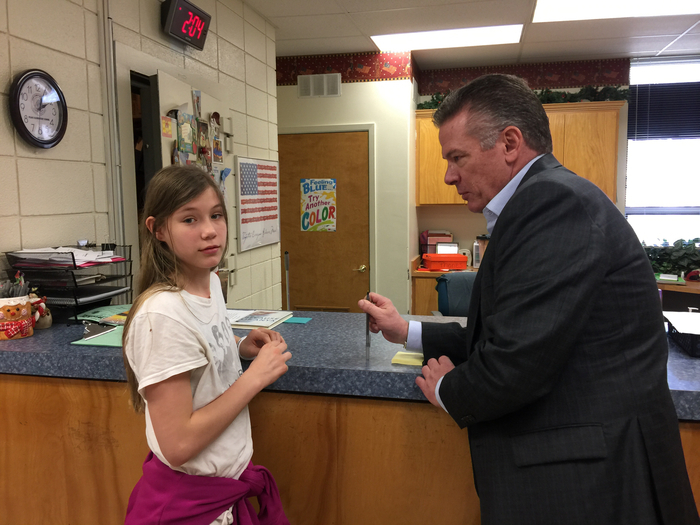 Report Cards for the third grading period are being mailed home today. 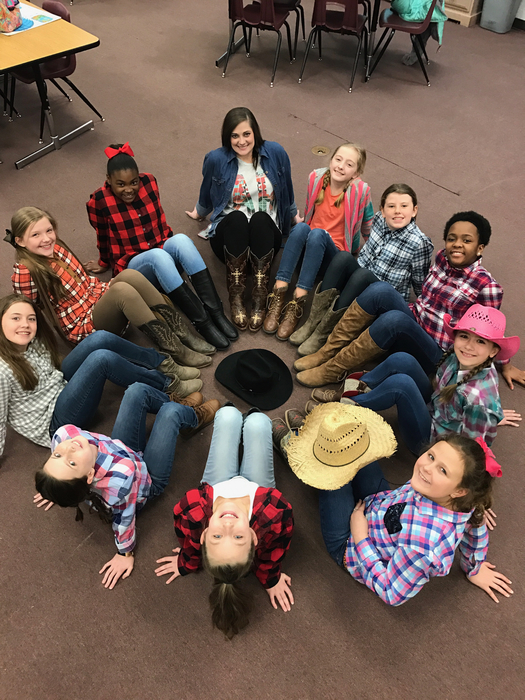 Winter musical is today at 1:30 and 6:00 p.m. "Mirror Image" features the classes of Clark, Daniell and Jones, along with the New Edition Choir and C.S. dancers. Hope to see you there! Goodies with Grandparents tomorrow at 7:30 a.m. in the Peake Library! Hope to see all of our Peake GRANDS!!! 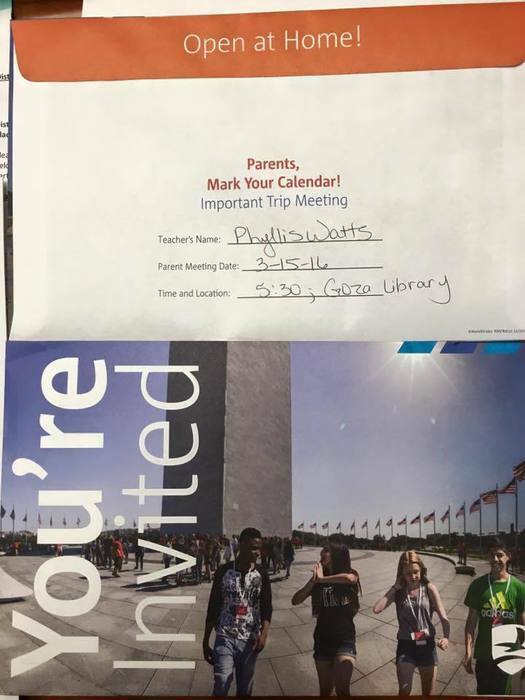 5th Grade students will bring home information about a Washington D.C. trip available to Goza students next year. Parent meeting will be March 15th at 5:30 in the Goza Library. Parent-Teacher Conferences TODAY from 2 - 7 by appointment. 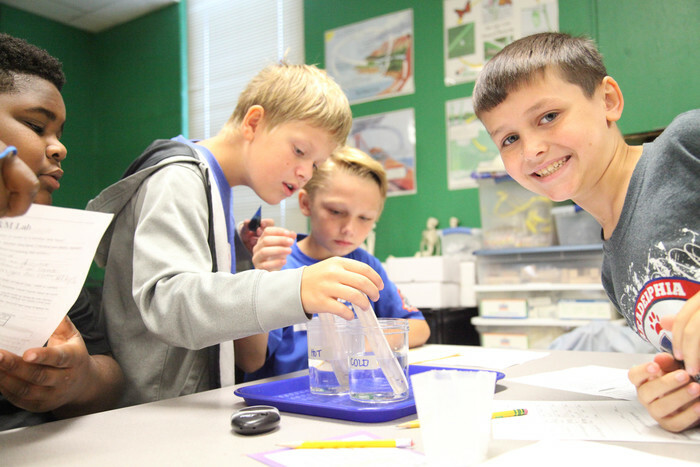 Call the office if you are not sure of your appointment time with homeroom teacher. We hope to have 100% participation! PPIP (Parent Group) will be meeting at 5:30 on Thursday evening this week. All parents are invited to attend to learn more about volunteering, student assessments and school communication efforts. No school Monday! 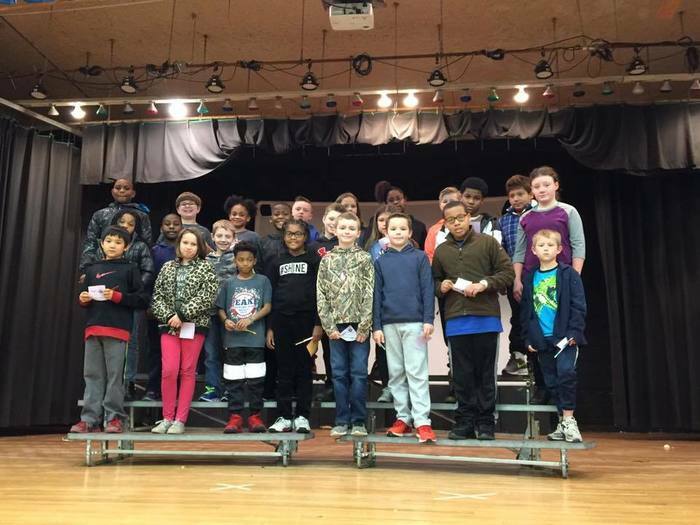 1st Semester Awards assemblies are Tuesday at 8:15 for 4th grade and 9:30 for 5th grade. Parents welcome to attend. Guest speaker, Miss HSU, at 9:00. Have a great weekend! Report cards will be mailed home today. Awards assemblies will be Tuesday, January 19th. 4th grade @ 8:15; 5th grade @ 9:30. 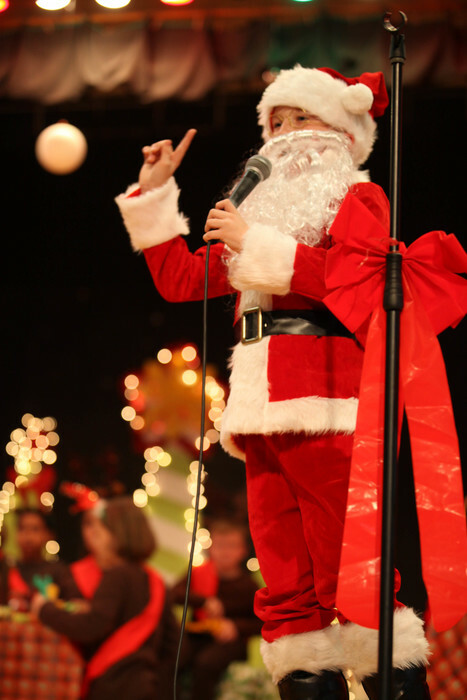 Date and Time Change for Christmas Musical: Moved from Thurs, Dec. 10th to Tues, Dec. 15th at 1:30 and 5:30 p.m. Featuring Classes of Calhoon, Wright & Jackson; Choir & Dancers. Donuts for Dads tomorrow morning in the Library @ 7:30 a.m. Hope to see all our dads and students! Tonight is Watch Dog Pizza Night! 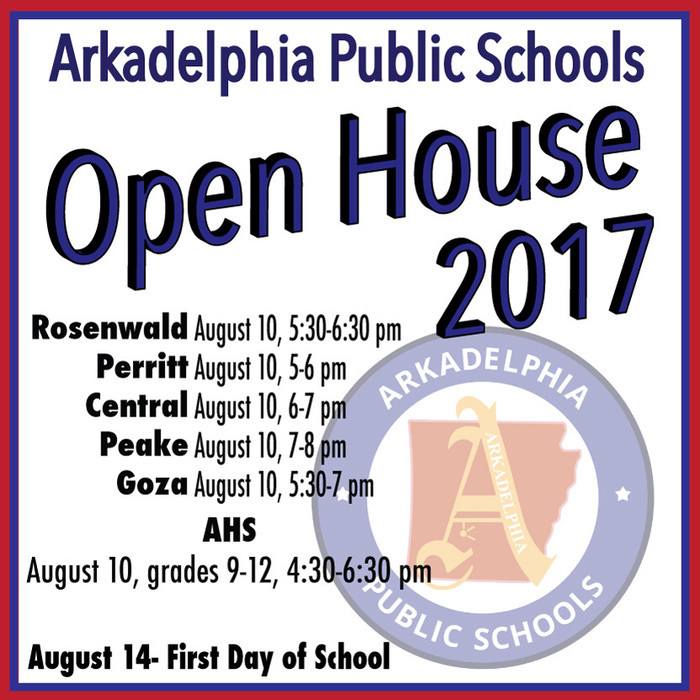 5:30-6:30 pm at Arkadelphia High School. All Perritt, Central, and Peake dads, granddads, uncles, step-dads, and dad friends are invited! Hope to see you there! Our Annual Report to the Public / Title I Meeting for the 2015-2016 school year, outlining what we are doing at Peake to help our students, will be Wednesday, November 11th at 12:00 noon in the Library. You may get a lunch tray in the cafeteria line for $3.60 if you would like before coming to the library for the meeting. The menu for that day is taco casserole, corn, salad, rosey applesauce, cornbread and milk. You are also welcome to bring your own lunch. We just hope you will be able to join us! 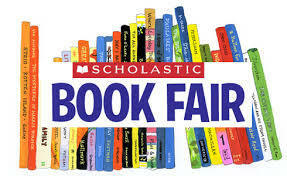 Book Fair is coming to Peake this week! Come by and check it out with your student beginning Tuesday! 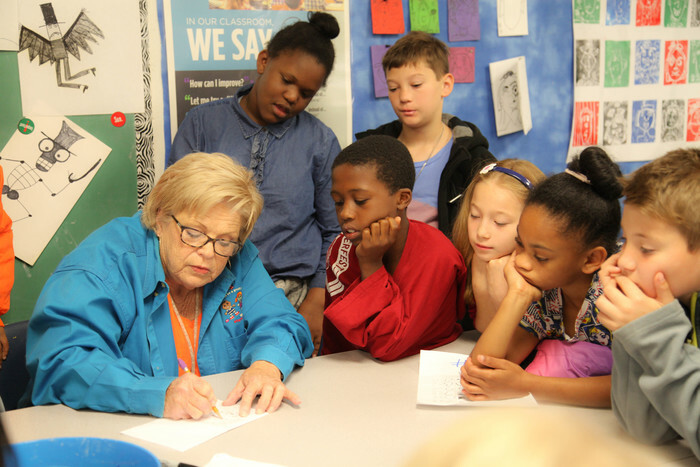 Peake set to celebrate J. Ed Peake Day tomorrow at 2:00 with guest speaker, Mrs. Ida Reed Harris. Fall Pictures at Peake have been rescheduled for November 18th. Order forms will be sent out prior to that date. National Walk to School Day is tomorrow, Wed., Oct. 7th! Join us at the Pine St. Goza Annex parking lot to walk to Peake. Meet at 7:05 a.m.; walking at 7:15. Happy Tuesday! Check Communication Folders today...FREE Flu Shot forms and eSchool Login information is there! All passwords have changed in eSchool. Peake Parent Group Organizational Meeting tomorrow at 11:00 am in the Library! Time sent home Tuesday (12:00) was incorrect. Hope to see you there! "Breakfast with Heroes" Fri morning. Info and RSVP form sent home Tues. Please return form or call the office if your child is bringing a guest. Form is avail. on website in Documents folder. Enjoy your 3-day weekend! No school on Monday in honor of Labor Day. Have fun and be safe! We are off to a great start! Please return all forms that require signatures as soon as possible. More communication coming home in today's folder. Thanks! Awards Assemblies will be tomorrow, June 10th. 4th Grade at 12:30; 5th Grade at 1:30...Hope to see everyone here! Thanks for a great year! 5th Grade Parents: Field trip is tomorrow! Going to Benton for a movie then back to Feaster Park for lunch and some softball! 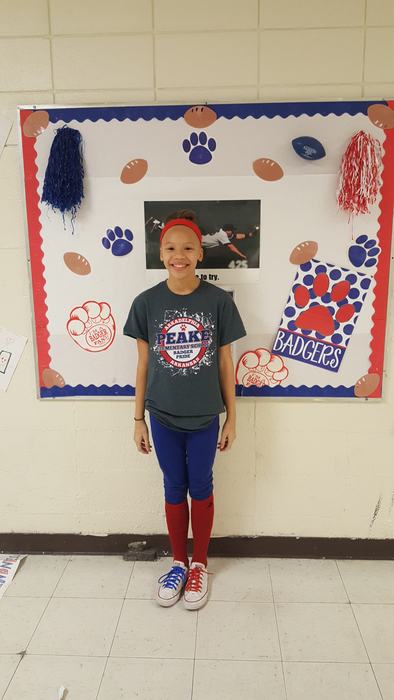 Students must be on time and wear their gray Peake t-shirt. Muffins with Moms tomorrow, May 15th, starting at 7:30 a.m. in the Library ! Hope to see lots of Moms! We appreciate you! 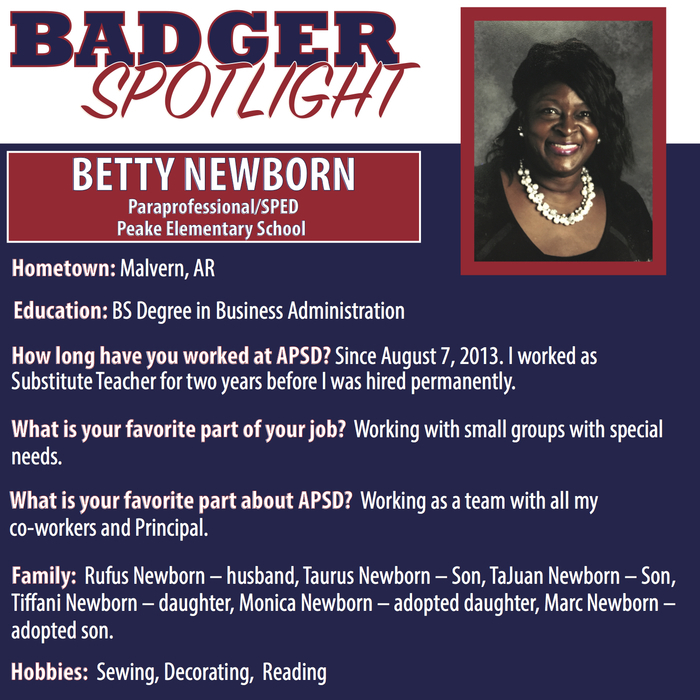 The Inaugural Arkadelphia Badger Pageant applications are in the front office. If you are interested in having your child participate in this event on June 6, please come by the office and pick up an application. Entry forms are due May 27th and must be turned into Mrs. Ivy at AHS. Who will represent our school for the 2015-2016 school year? 5th Grade Field Day is tomorrow, 8:30 - 10:30 a.m. Starting in the gym, then moving to playground. Bring a change of shoes/clothes if participating in outdoor events. It will be wet and muddy! Our final PARCC testing will be Mon - Wed, March 4 - 6. Students need to bring personal ear buds if they don't already have a pair at school. 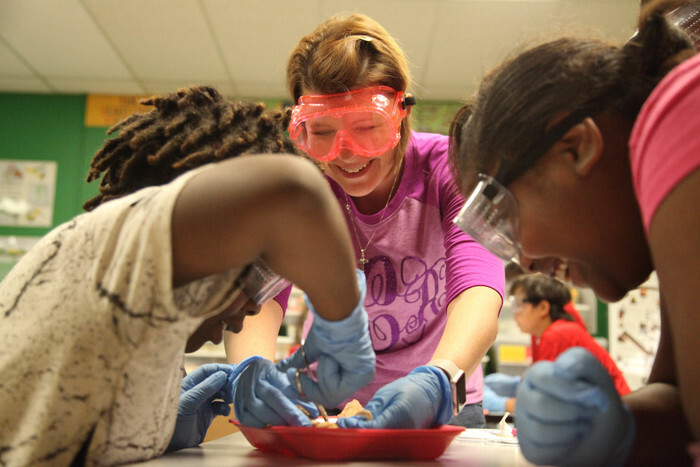 School-owned pairs will have to be cleaned and re-used. 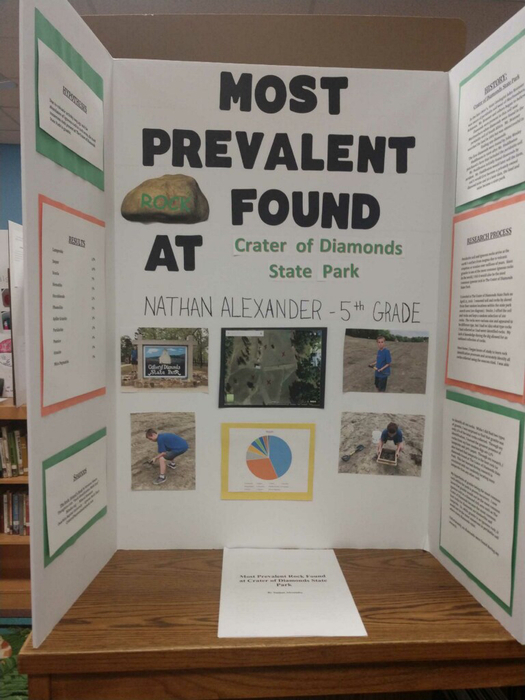 4th Grade Field Trip tomorrow: Must wear gray Peake shirt, be on time and bring sunscreen! Loading buses at 8:15. Don't forget to bring a sack lunch if you didn't request a school lunch. 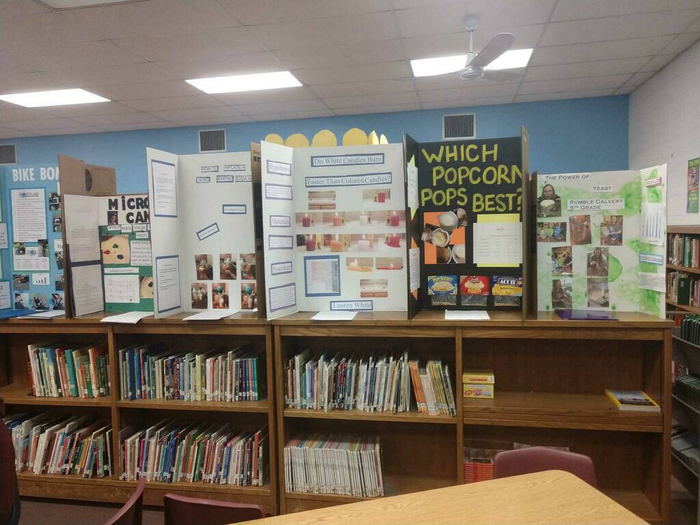 Science Fair projects can be viewed tomorrow in the library. 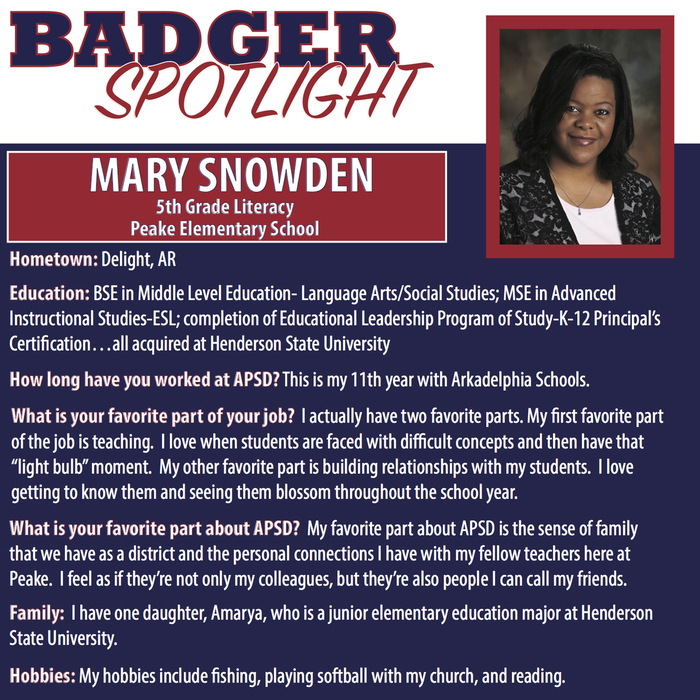 Results are in the Peake Weekly newsletter today. 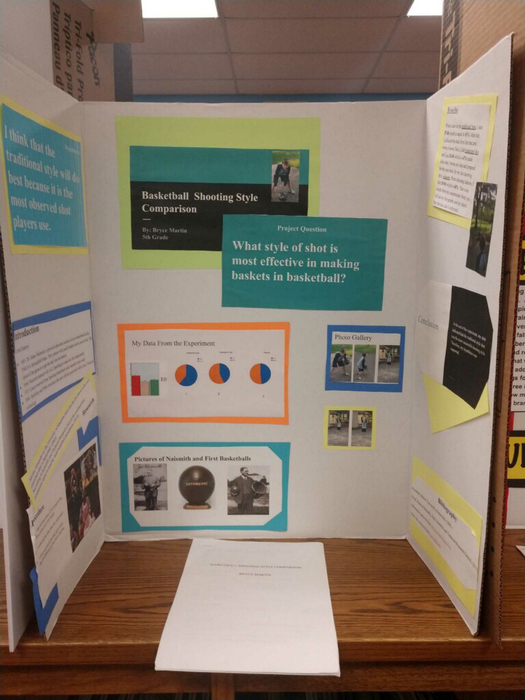 Projects need to be taken home at the end of the day tomorrow. The music of Grease will be presented again at Badger Stadium Friday night during Relay for Life. Performance time is 7:00. Notes were sent home with students involved. Hope all can come! Tomorrow is PJ Day! Bring $1 to donate to Relay for Life and wear school-appropriate pajamas to school! No robes or house shoes will be allowed. CALLING ALL GRANDS! Peake is hosting Goodies with Grandparents tomorrow morning (Friday) in the Library from 7:30 - 8:00 a.m. Hope lots of GRAND-parents can join their GRAND-kids for breakfast! Relay for Life Update: Slime the Teacher contest still going...new twist! Any teacher that earns $100 or more gets SLIMED!!! Final count will be Friday morning! Keep up the donations! 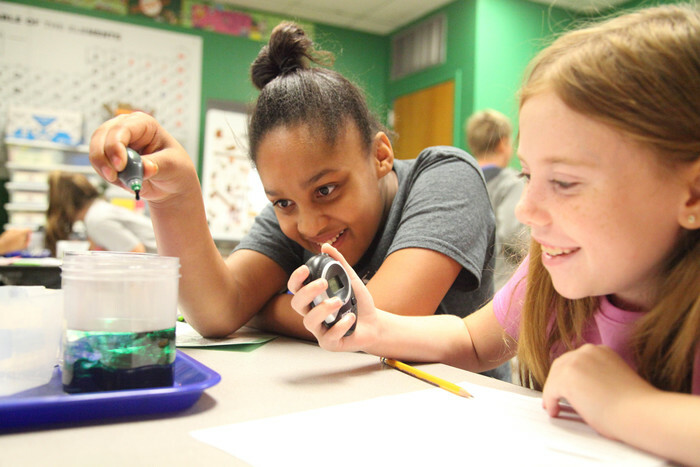 Due to standing water at the Desoto Bluff area and more anticipated rain on Wednesday, the 4th Grade trips scheduled for this week were canceled. Don't forget that Peake is participating in Relay for Life. 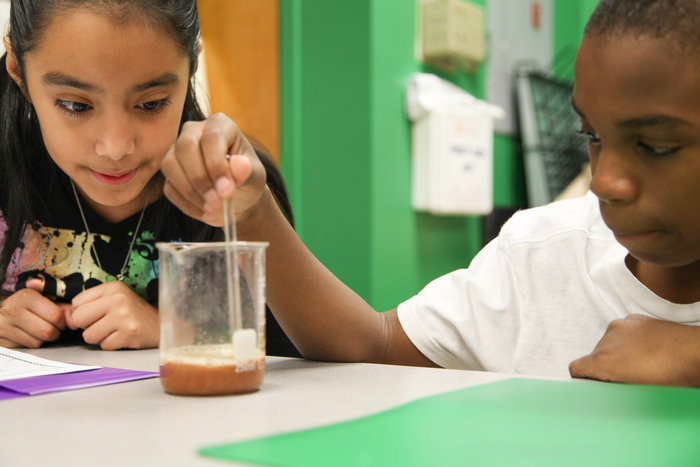 Currently, we are having a "Slime the Teacher" contest! 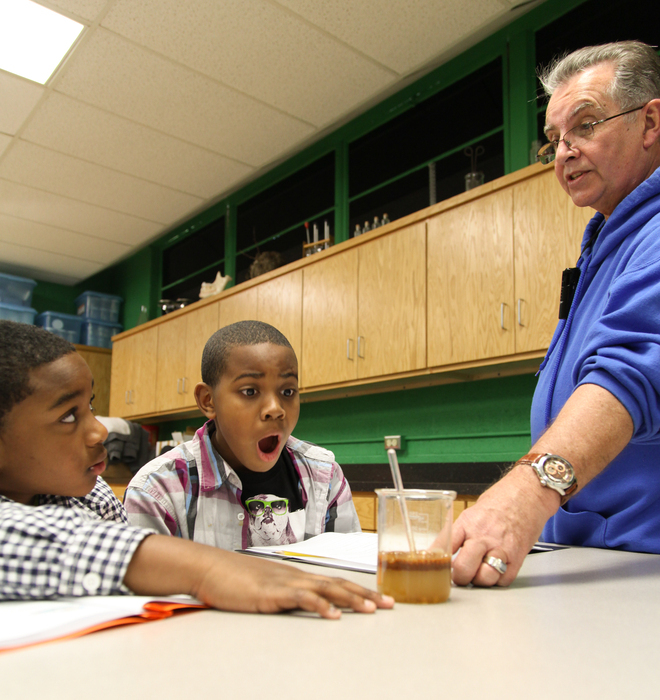 The teacher with the most contributions gets slimed! Contest ends this Wednesday. 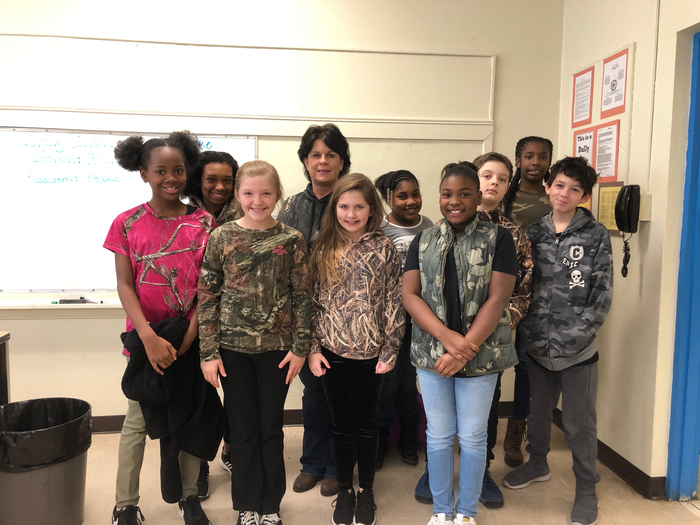 Next Week: Class/Group Pictures on Monday; 5th Grade Science Benchmark on Tues. and Wed; 4th Grade field trips to Desoto Bluff (in town) Tues. and Thurs; Goodies w/Grandparents Fri. Busy Week! Attention Peake Student Council members: Wear navy blue Peake Student Council shirts to school tomorrow for yearbook picture! 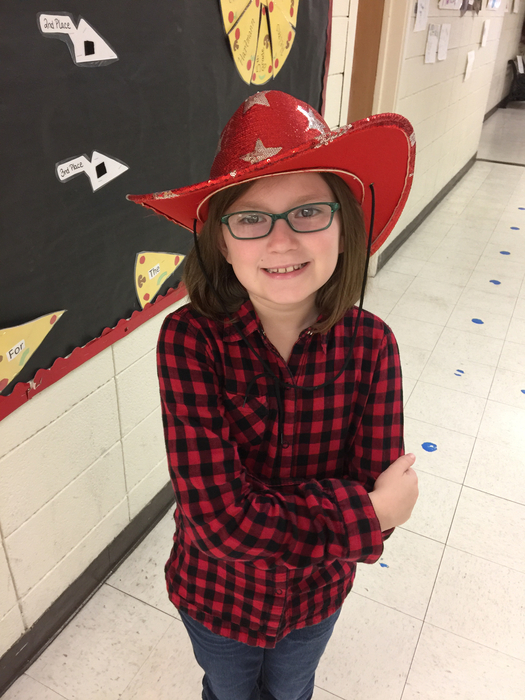 Hat Day tomorrow, Friday, April 3rd! Bring $1.00 to donate to Relay for Life and wear your hat to school! Goodies for Grandparents has been rescheduled for Friday, April 17th. 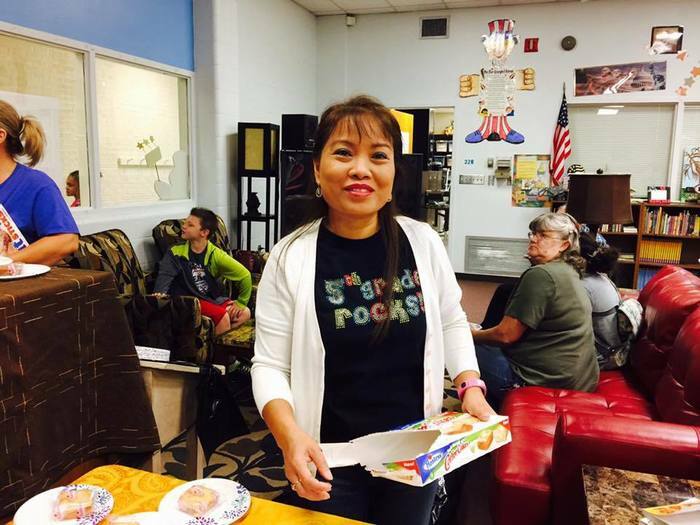 Light breakfast goodies will be served in the library from 7:30 - 8:00 a.m. for students and their grandparents. 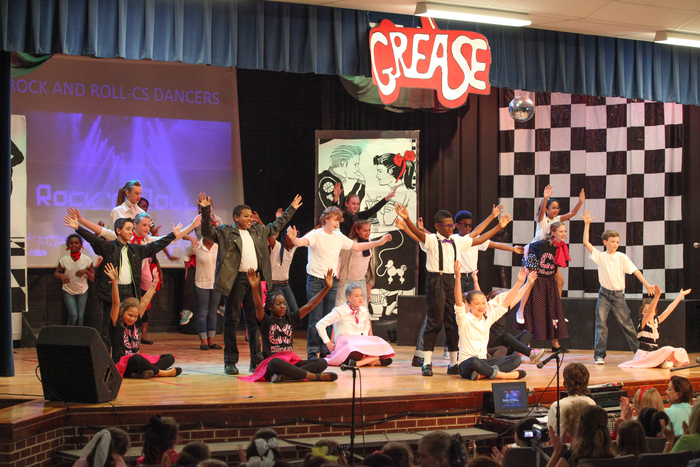 The Winter Musical, "Grease," has been rescheduled for Tuesday, April 7th. 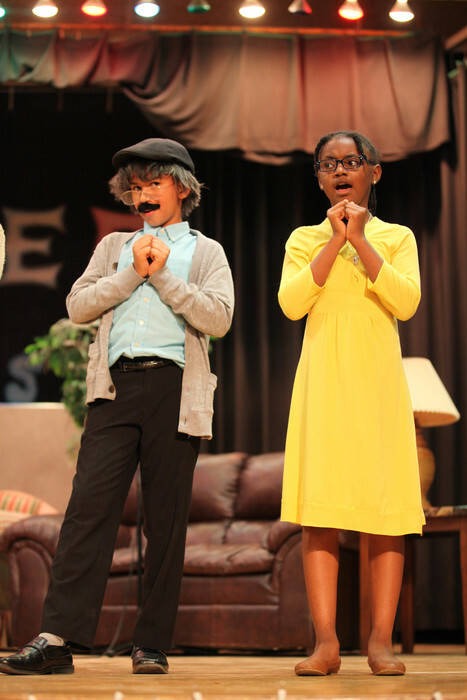 Show times are at 1:30 and 6:00 p.m.
Due to days out for inclement weather, the end of the 3rd grading period has been changed from March 17th to March 31st. Report cards will be sent home the following Tuesday, April 7th. 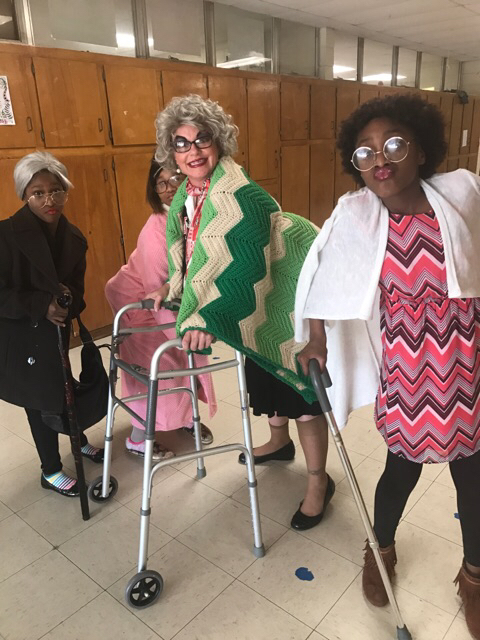 Thursday's musical and Friday's Goodies for Grandparents will be rescheduled. We apologize for any inconvenience. The new dates and times will be announced as soon as possible. Stay warm and be safe. 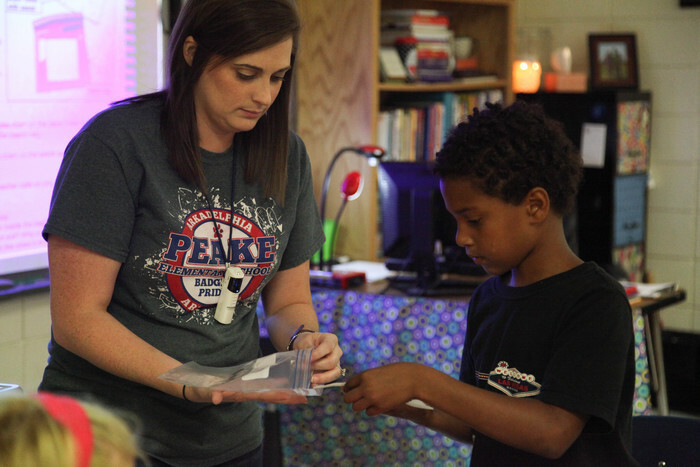 Peake will be PARCC testing for the next two weeks (Mar 9 - 20). Lunch schedules will be inconsistent so we are asking that students not have visitors for lunch during this time. Thank you. Please join us for "Goodies for Grandparents" this Friday, March 6th beginning at 7:30 am in the Peake Media Center. Hope to see everyone bright and early! 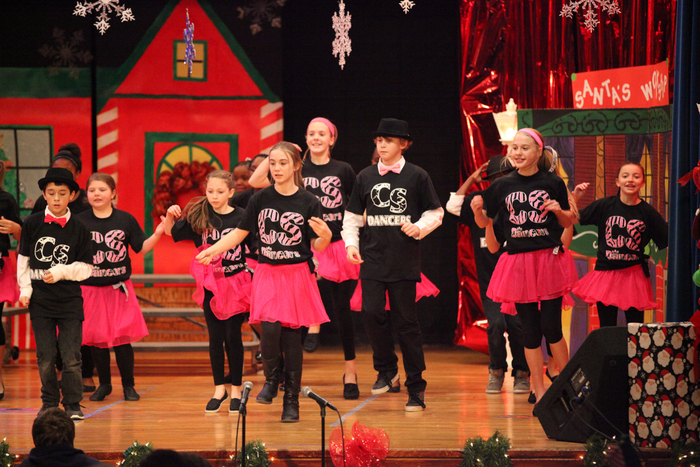 Winter Musical, "Grease!" has been rescheduled for Thursday, March 5th. Hope to see everyone! Grease is the word! 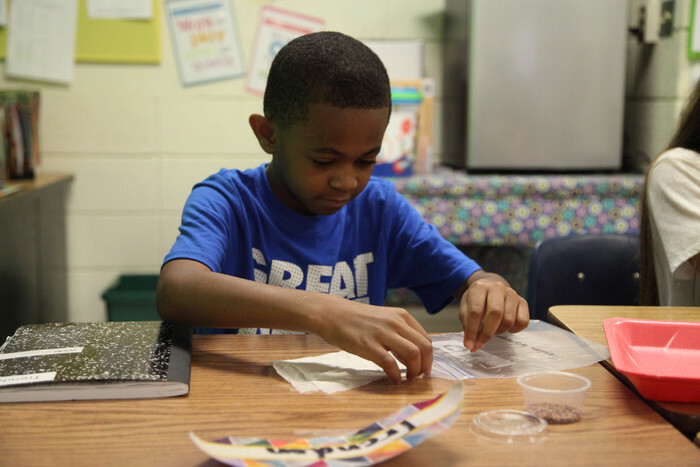 Check out the Documents folder on our Website for information about the Simple GIVING Snacks for Kids partnership with Walmart. Help kids in our community by donating! Program ends on March 4th. 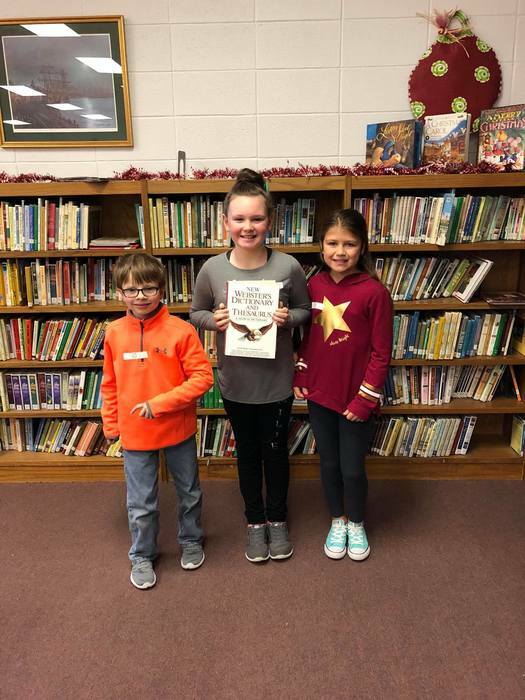 Congratulations to our 4th Grade Spelling Bee Winners: Cameron Jones, Champion; Seth Campbell, 2nd place; Renata Garcia, 3rd place. Good luck at the County Bee on Friday! 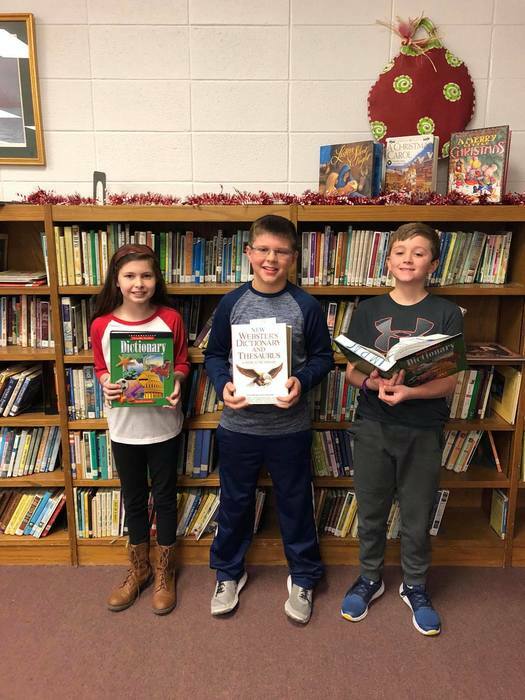 Congratulations to our 5th Grade Spelling Bee Winners: Merrilee Parker, Champion; Matthew Porter, 2nd place; Kyle Matocha, 3rd place. Good luck at the County Bee on Friday! Celebration of Success Assemblies were this morning! Check out our photos on Facebook at the following link: http://goo.gl/z8XSwu. Spelling Bee News: Study list coming home today! 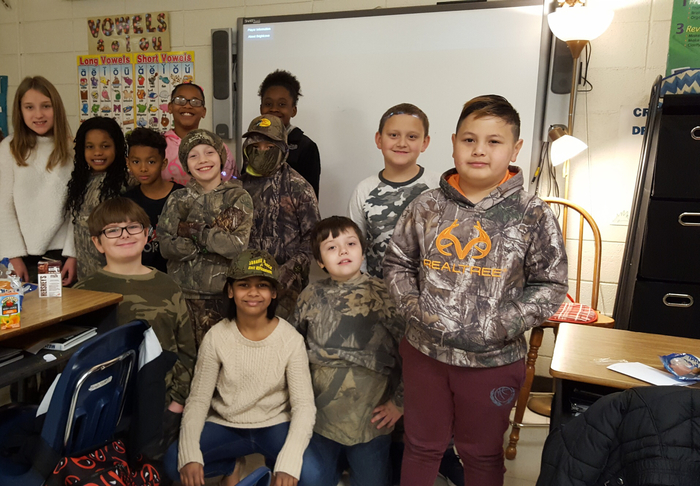 Class Bees on Jan 16; School Bee on Jan 26; County Bee on Jan 30. 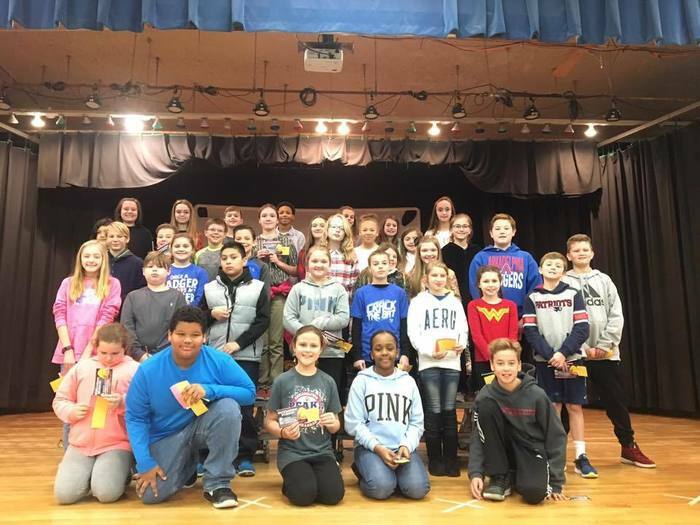 School Geographic Bee will be held Mon, Jan 12 at 8:30 in the Media Center. Parents of participants are welcome to attend. Don't forget to send canned/non-perishable food items to school by Wednesday for our Cans of Compassion campaign. All food will be donated to needy families at Christmas. Thank you! Event time change: The musical scheduled for Thursday, Dec.11th has changed from 2 and 6 o'clock performances to 1:30 and 7:00. 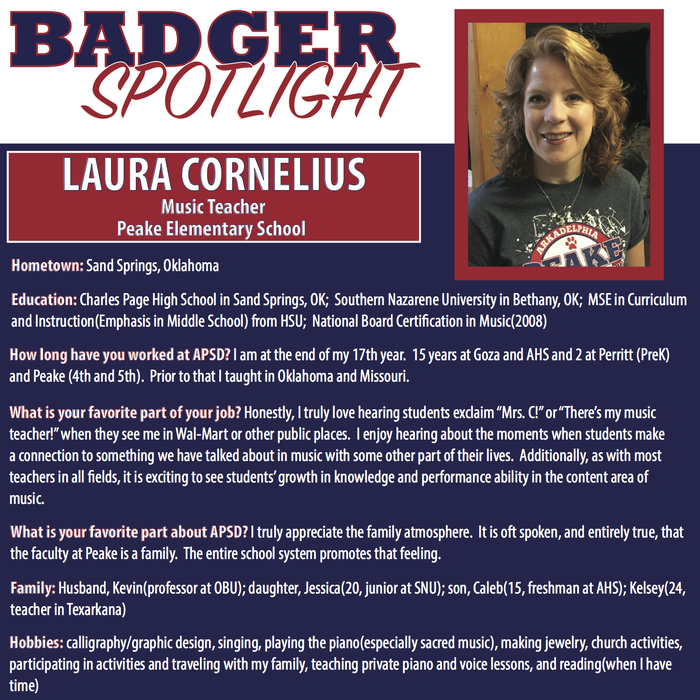 Featured classes are Daniell, Jackson, Wright, CS Dancers and Choir. Students enjoyed Donuts with Dads on Friday! To view the photo album, follow this link: http://goo.gl/fGZDUt. 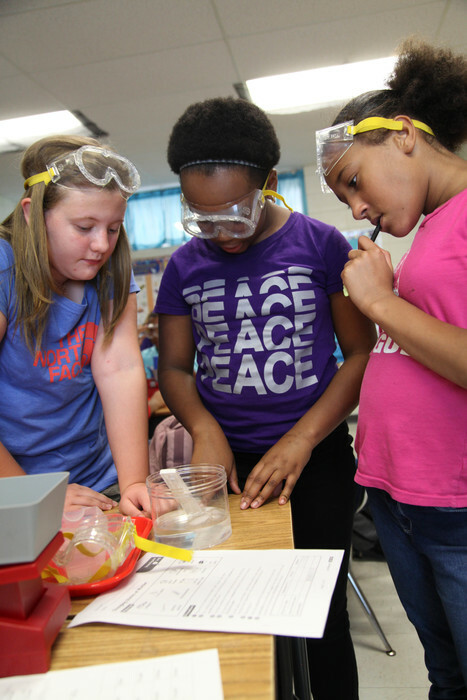 5th Grade Classes of Cotton, Crews and Snowden have been rescheduled to attend DeGray Science Day this Wednesday, December 10th. Dress warm! Please join us for Donuts for Dads this Friday, December 5th beginning at 7:30 AM in the Peake Media Center! Hope to see you bright and early! Progress Reports are in Communication Folders today! Attention ALL Dads of Perritt, Central, and Peake Students! 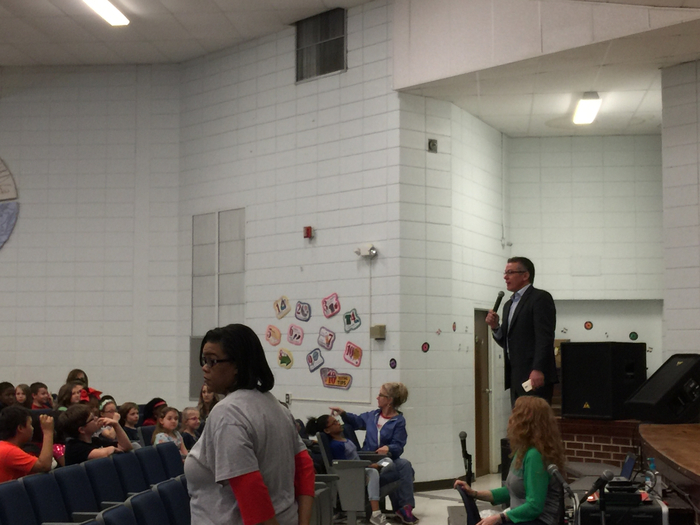 Please join us at Arkadelphia High School on Monday, November 3, 2014 from 5:30-6:30 for our annual WATCH D.O.G.S. Pizza Night! 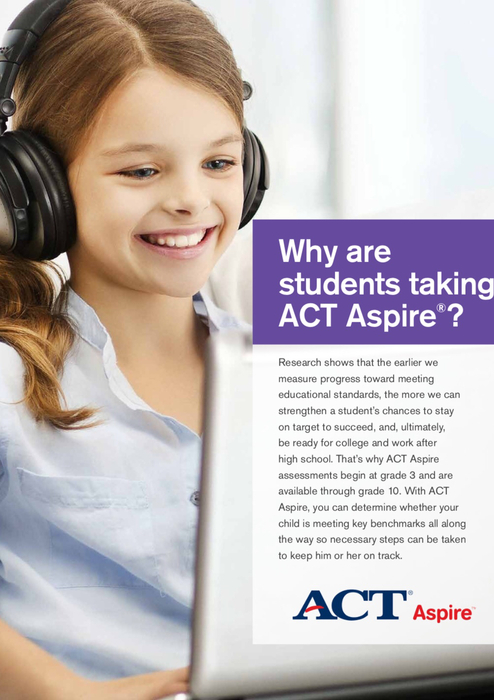 If you did not complete the online survey at PTC, please log on to http://www.advanc-ed.org/survey/public/4129587 and complete prior to Oct. 31st. Thank you! Calling all box tops! Please send in your box tops tomorrow! Ribbons and tattoos for Friday's game against Ashdown will be on sale tomorrow for $1. GO BADGERS! BEAT ASHDOWN! October 23 – Parent/Teacher Conferences 2:00 – 7:00. 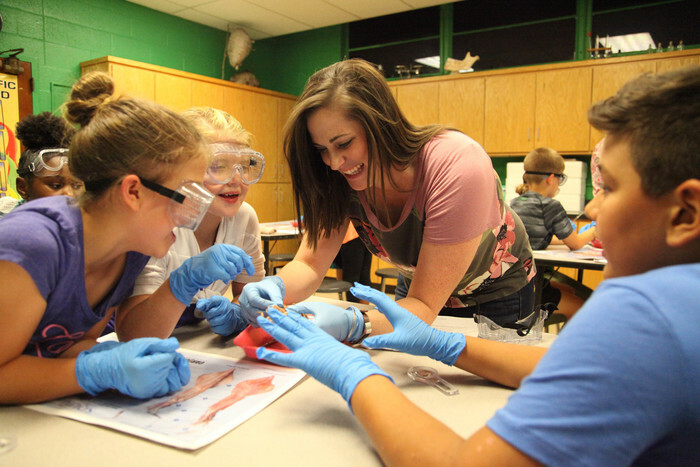 No school for students on October 23-24. Coming up tomorrow: Flu Shots and Fall Pictures. 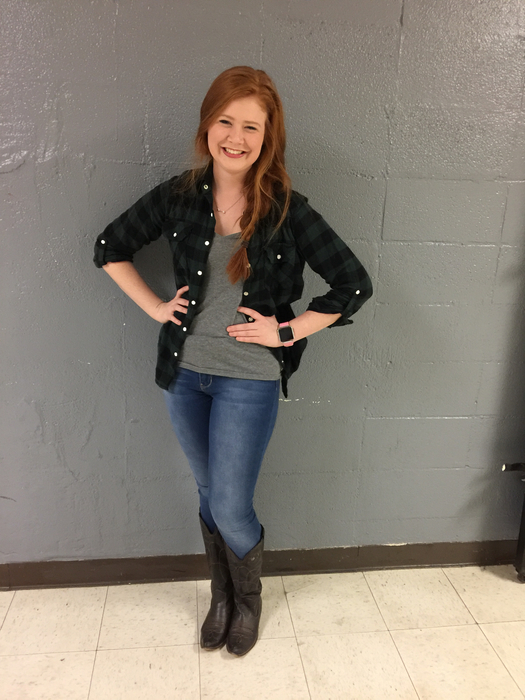 All students will have picture made for yearbook. If you want to purchase pictures, money needs to be paid before picture is taken. Join us on Tues, Oct 14th at 11:30 in the library for Peake's annual Report to the Public and Parent Organization meeting. Please return RSVP form that went home this week for planning purposes. 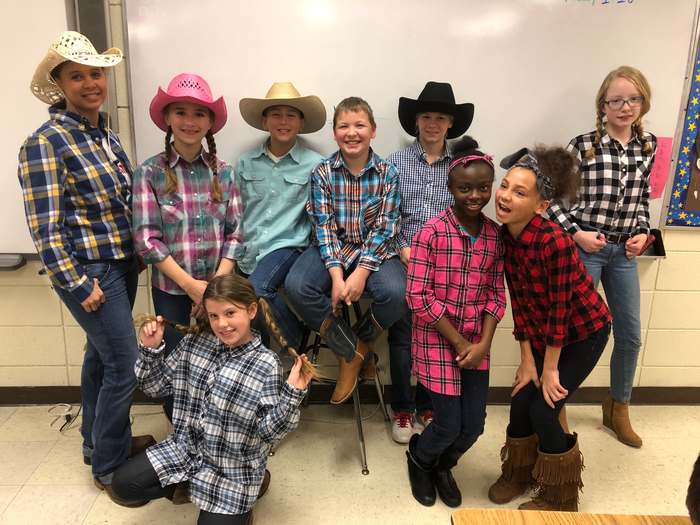 Don't miss our 5th graders in their musical "So You Think You Can Dance" featuring homeroom classes of Cotton, Crews & Rippeto at 2 & 6 p.m. on Thursday! 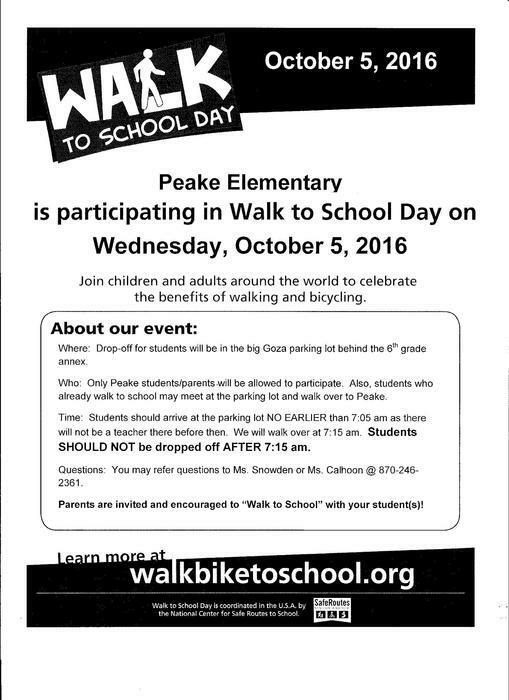 Join us on Wednesday morning for the INTERNATIONAL WALK TO SCHOOL DAY! Start your day with a fun walk! See the attached flier for details. FRIDAY, OCT. 3rd: PINK OUT DAY in honor of Breast Cancer Awareness! 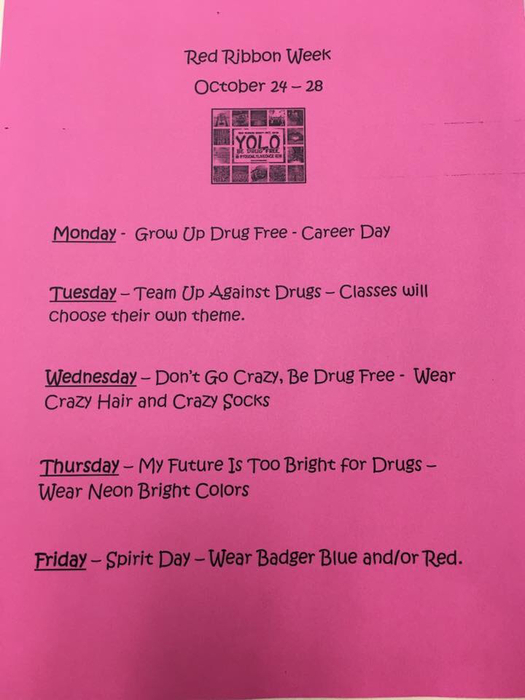 Wear pink to school! Also, Badger spirit ribbons and face tattoos (paw prints) will be on sale for $1 each. GO BADGERS! Free flu shots will be given on October 15th to Peake students who sign up. Forms are due tomorrow if you want your child to have a shot. Forms were sent home in last week's communication folder. Congratulations to our 2014-15 Early Act Student Council officers: President Jarrett B., VP Donovan W., Secretary Kennedy C., Treasurer Haedyn T! Coming up tomorrow: Student Council Elections...Good Luck to all candidates! Badger Spirit Ribbons on sale...Get yours for $1! 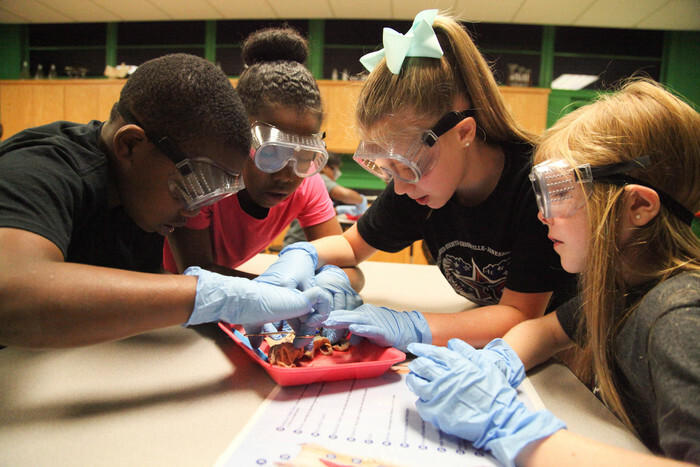 4th Grade Vision/Hearing Screenings...Be sure to bring your glasses! Henderson State University Football Players visited our campus today to share their views on Academics, Integrity & Teamwork! Free passes were given to all Peake students for Thursday night's game! Tomorrow is School Banking Day! 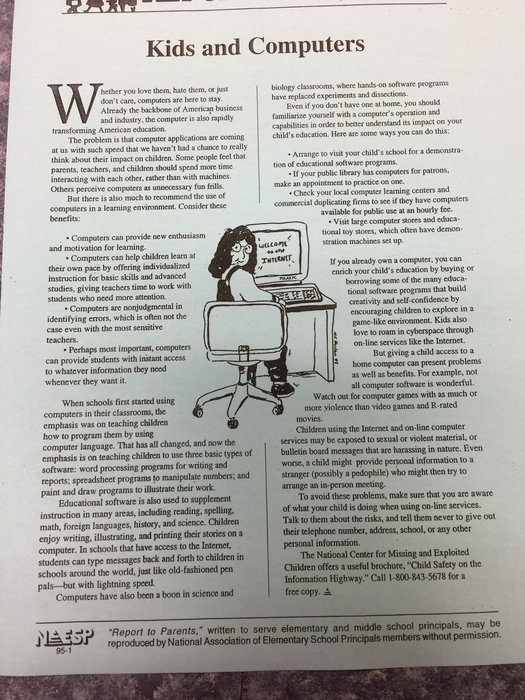 If you don't have an account for your child, and would like one, forms are available in the office to sign up. Student Council petitions will be available tomorrow,Tuesday, September 9th. 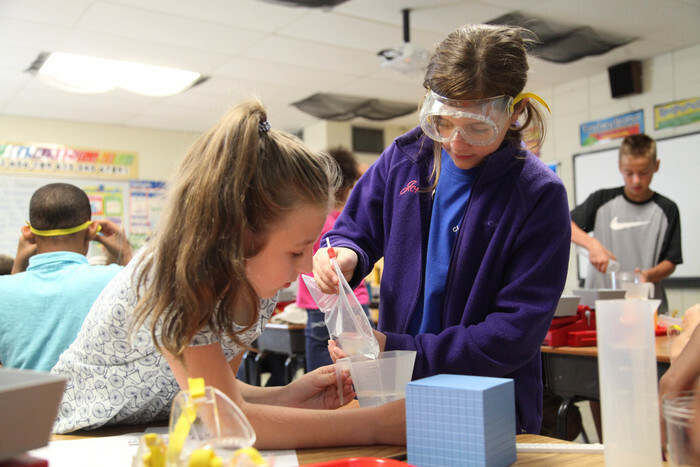 4th graders may run for Vice President and Treasurer. 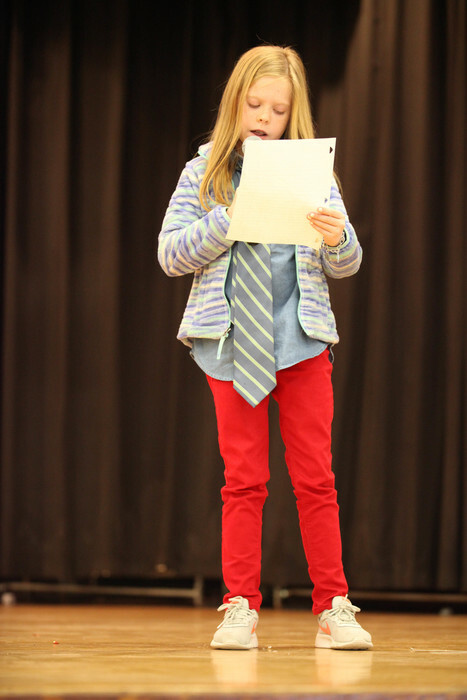 5th graders may run for President and Secretary. 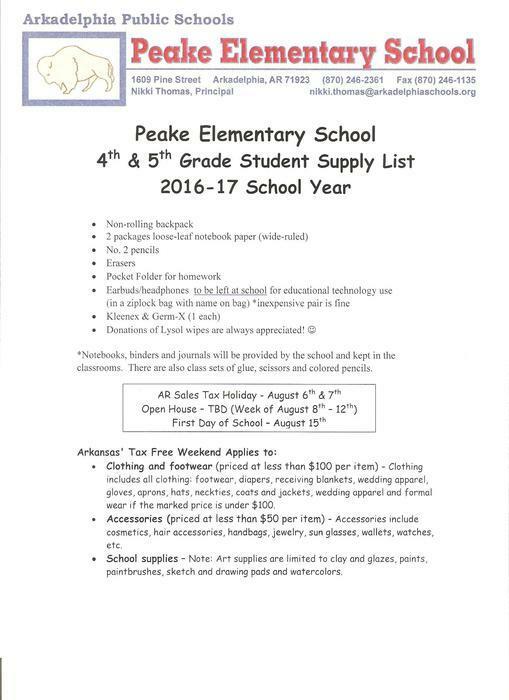 Please join us for Open House at Peake Elementary on August 14, from 7:00-8:00 PM! We are looking forward to meeting our new 4th Graders and returning 5th Graders!